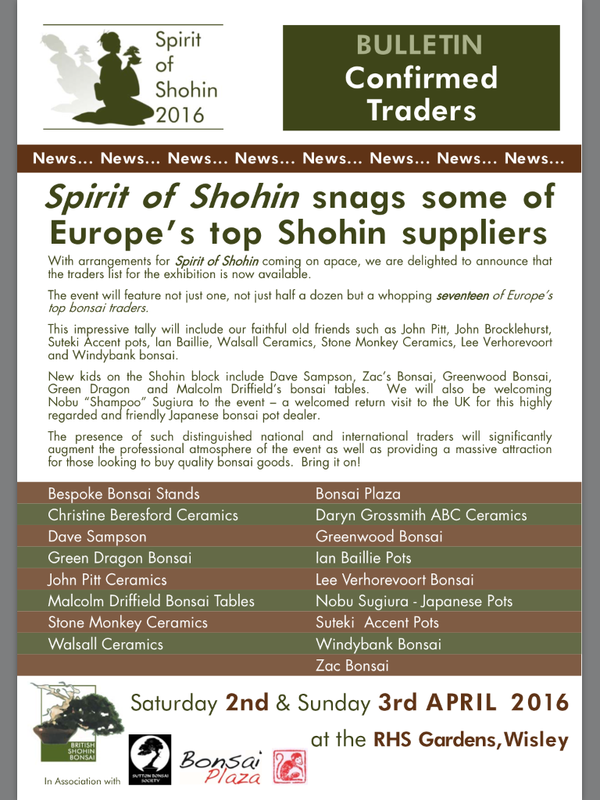 Spirit of shohin 2016 traders announced. 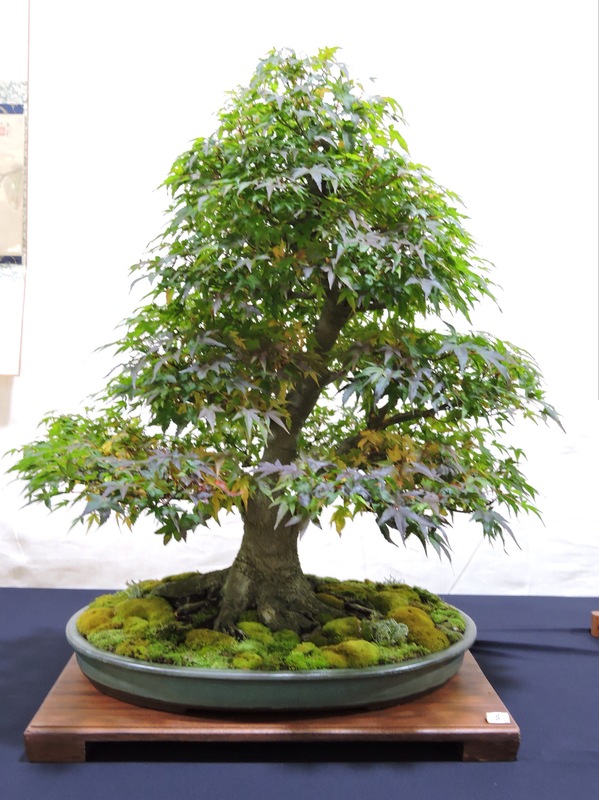 Now just a few short months away, the spirit of shohin show at the Wisley RHS gardens has announced its trader line up. 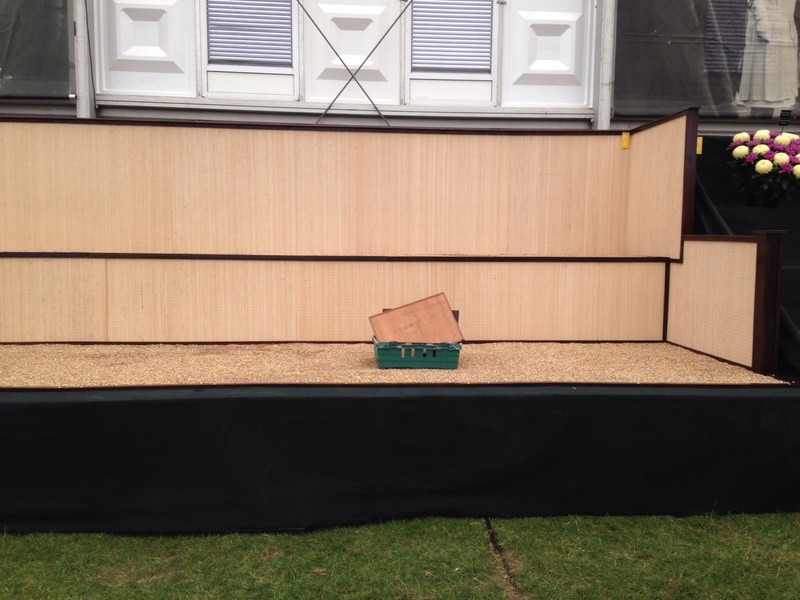 Also last week applications for display started, if you want more details please ask me. 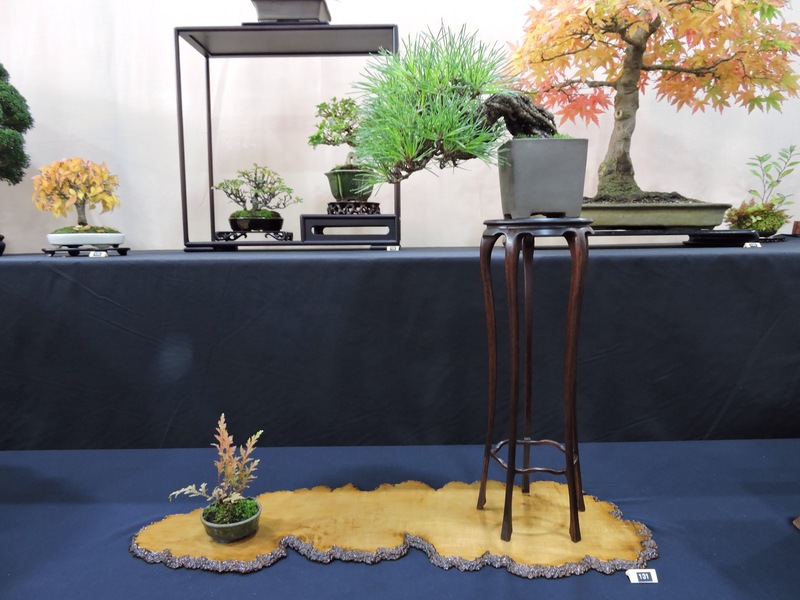 This was my contribution to the Sutton club display. 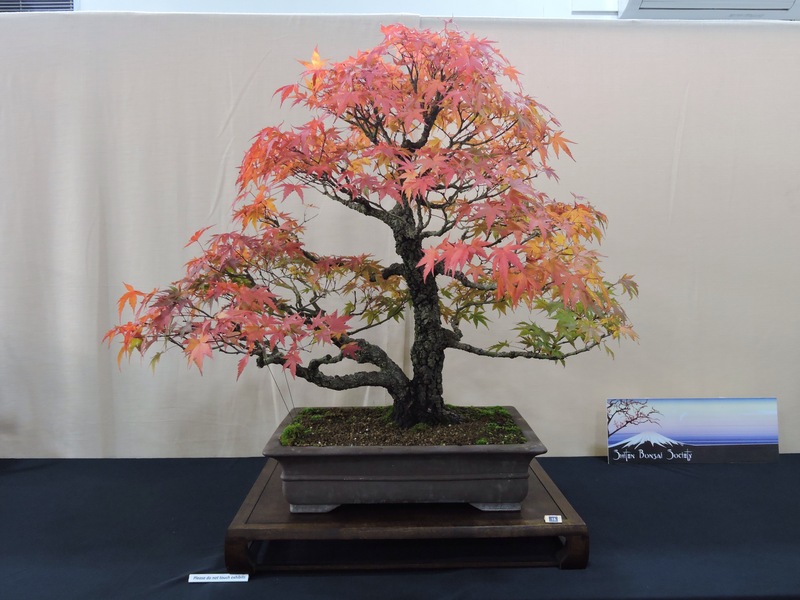 This is one of many people’s favourites at the end of the season, the show has steadily grown over the last few years. 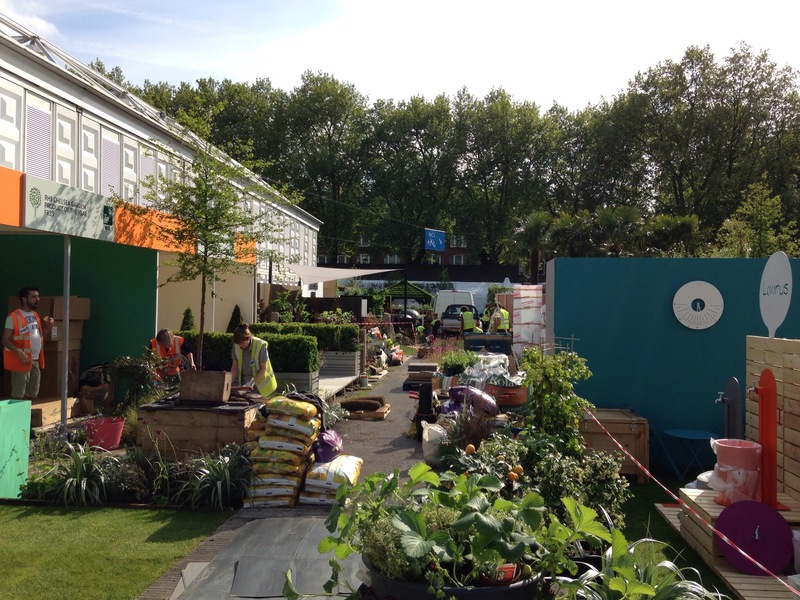 All credit has to go to Mark and Ming and the team of helpers they have to stage a great show. 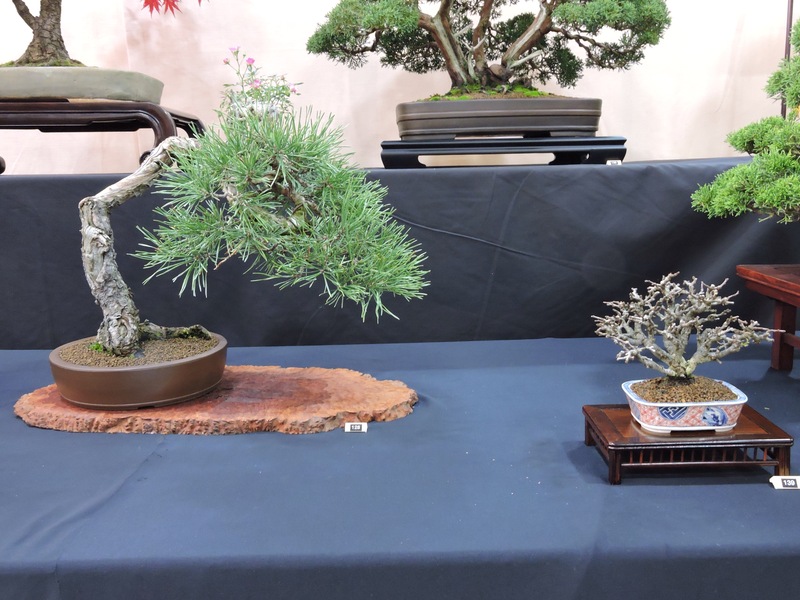 This is a look at some of my favourite trees. 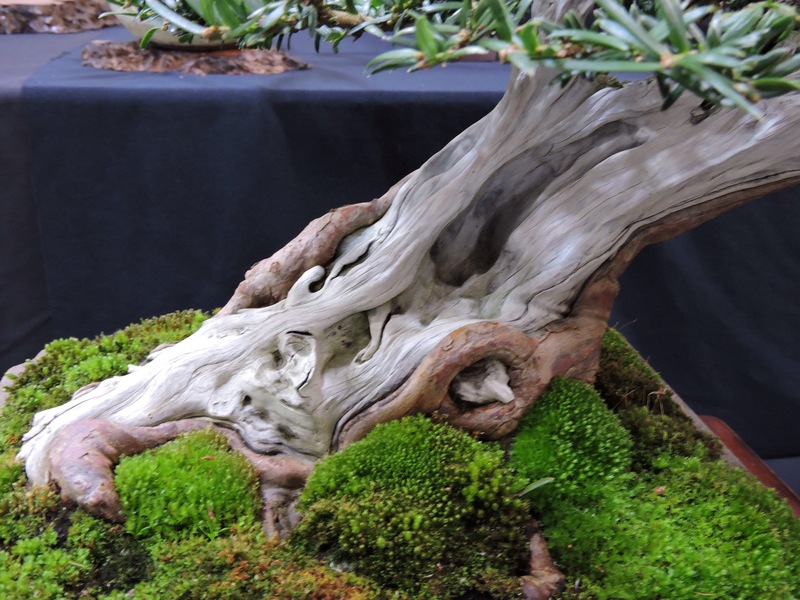 The dead wood on this Yew was superb and the way the swollen live veins frame the shari give it a good feeling of age. 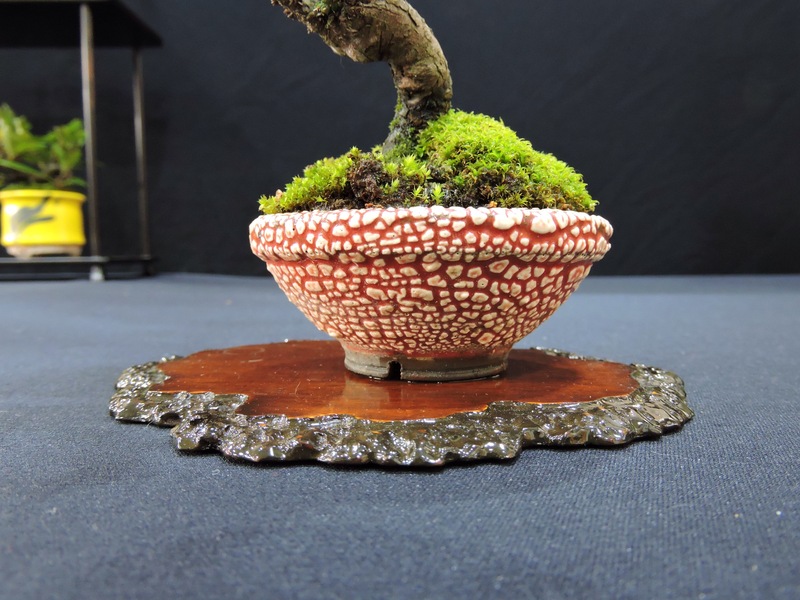 This little pot I love, if the owner sees this who made it please? 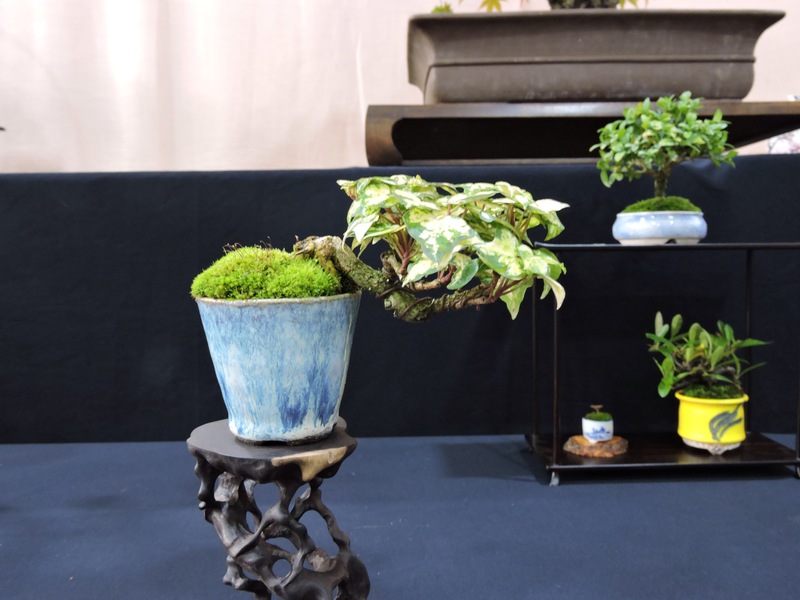 These two I loved buy many good accents around the show. 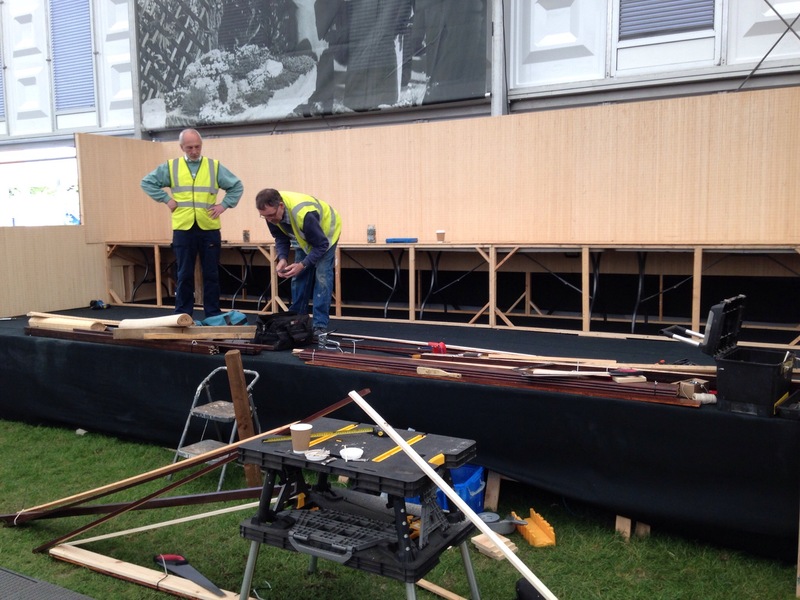 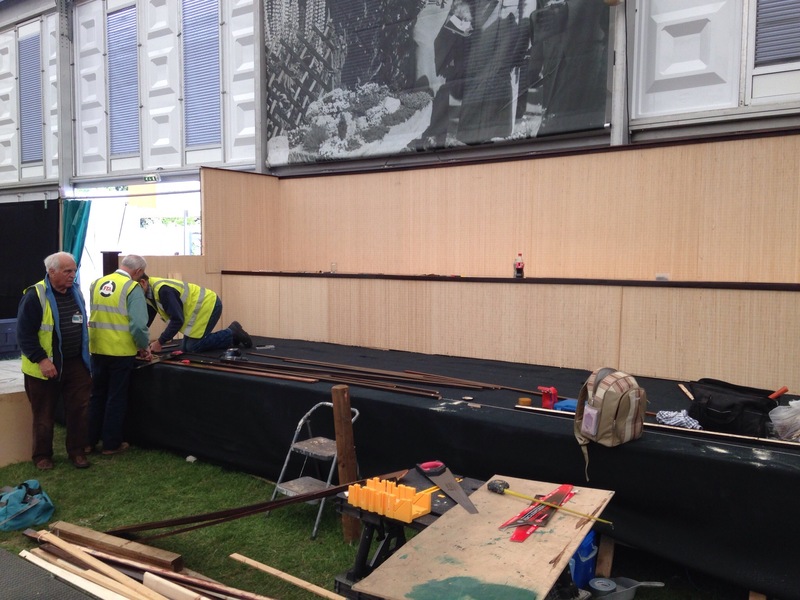 FOBBS Chelsea stand 2015 the big build. 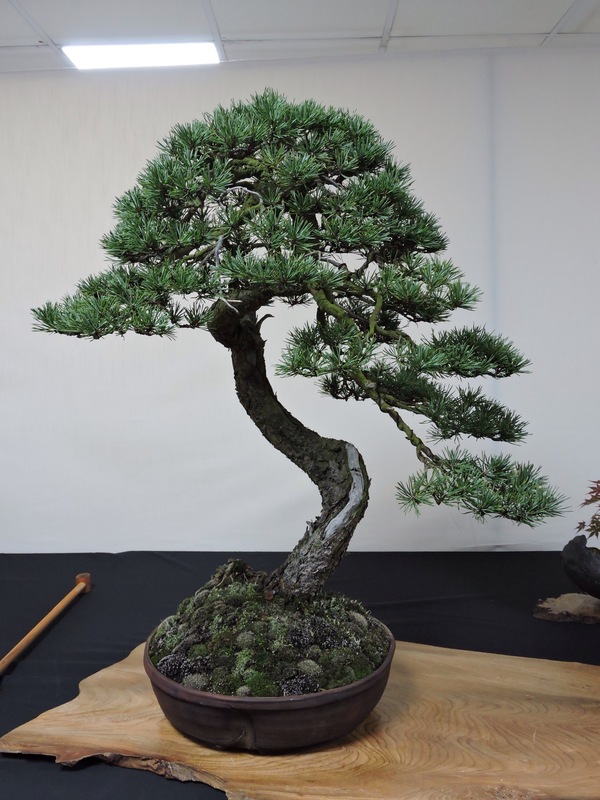 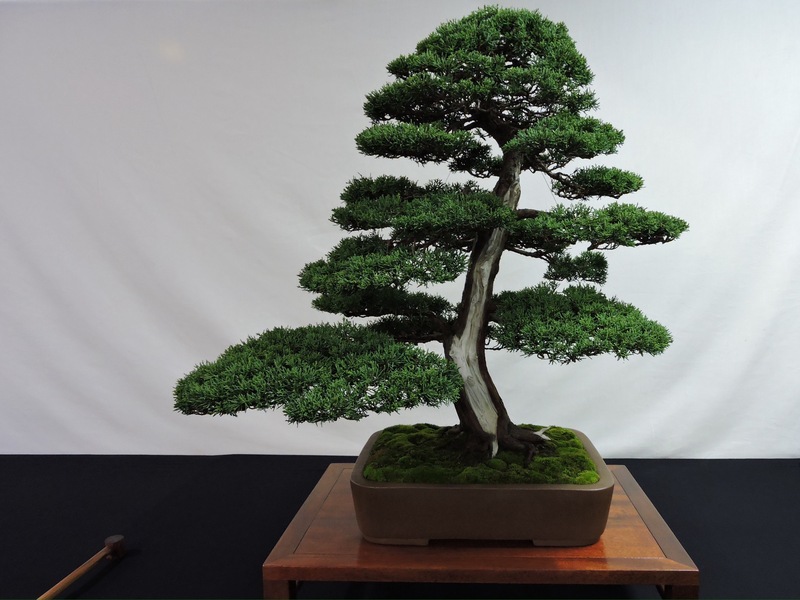 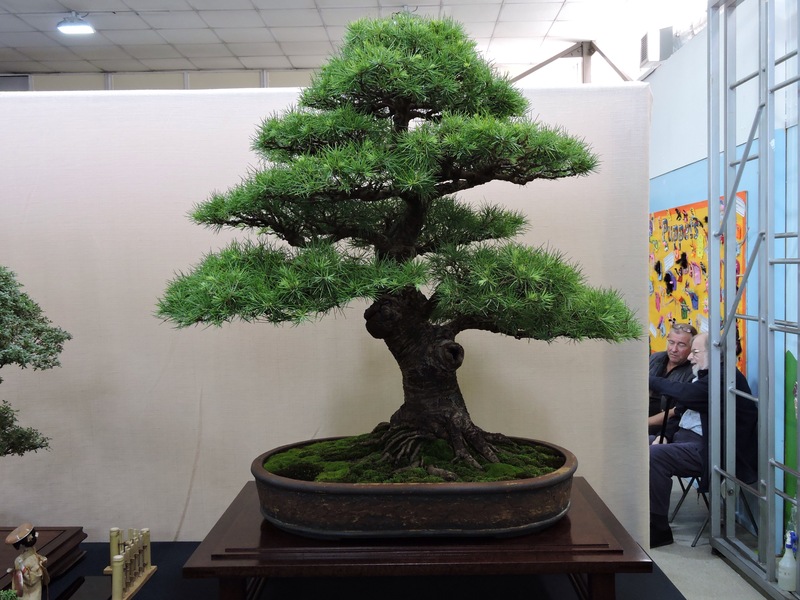 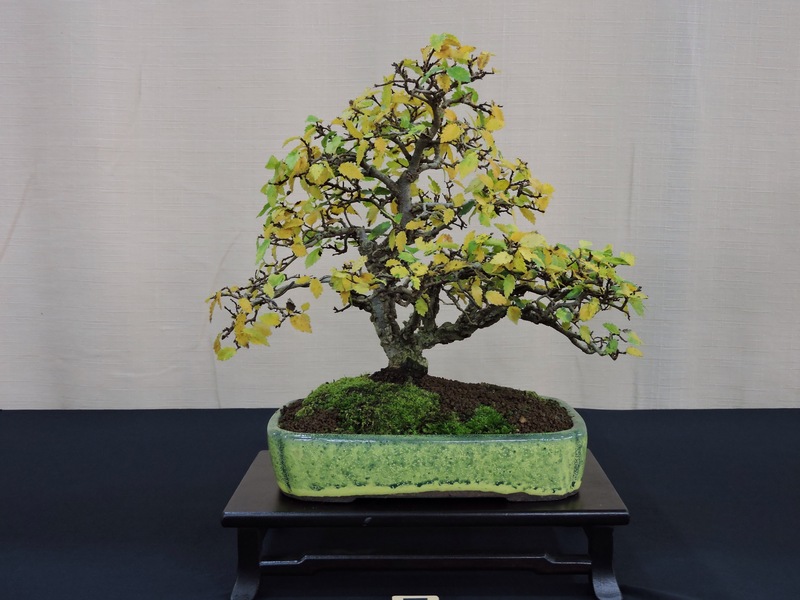 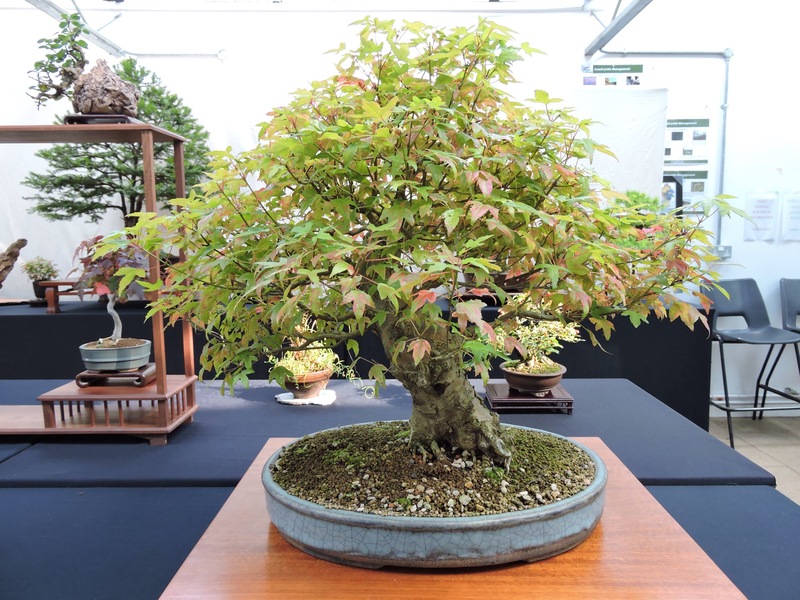 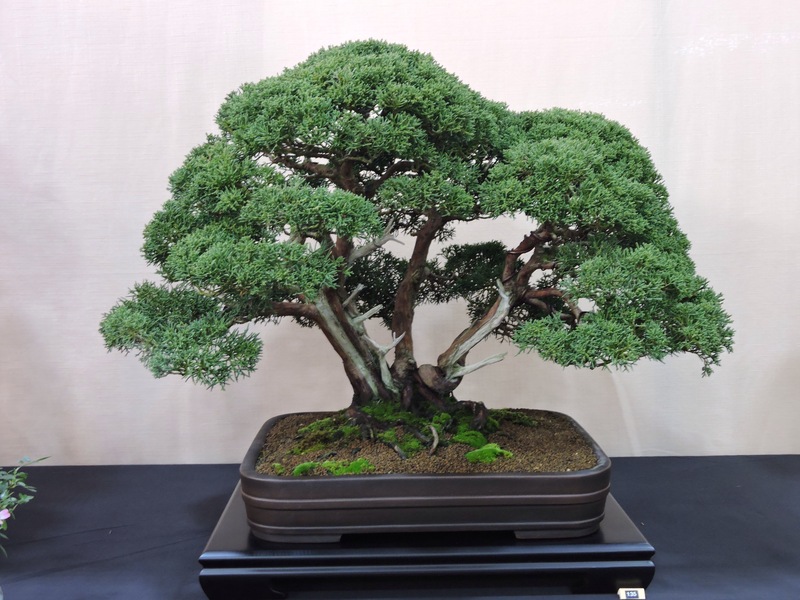 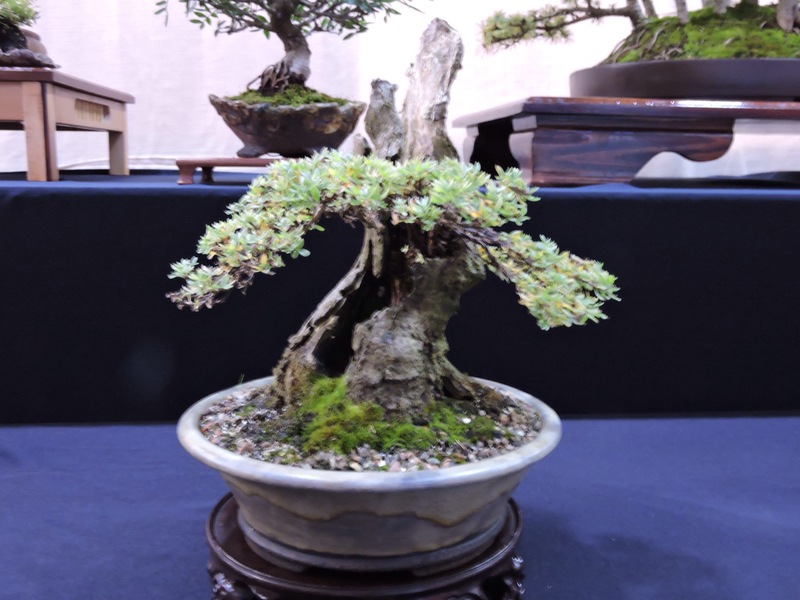 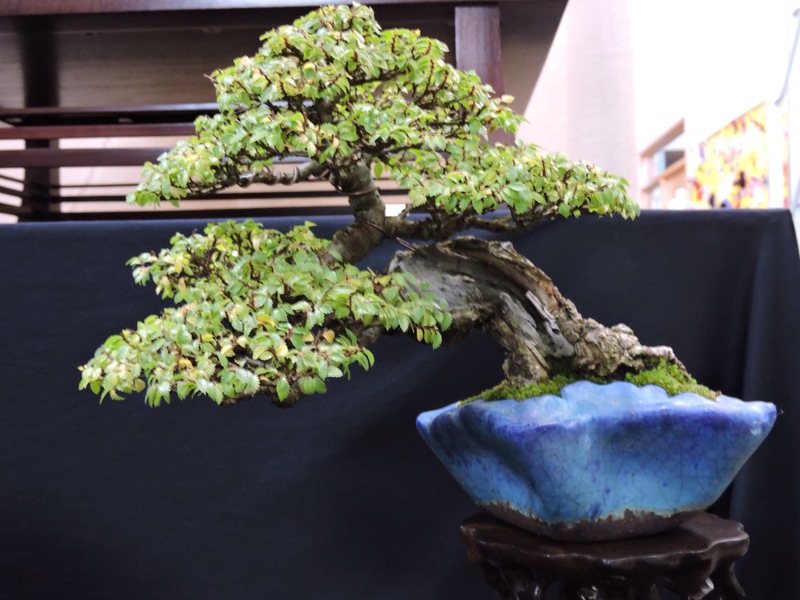 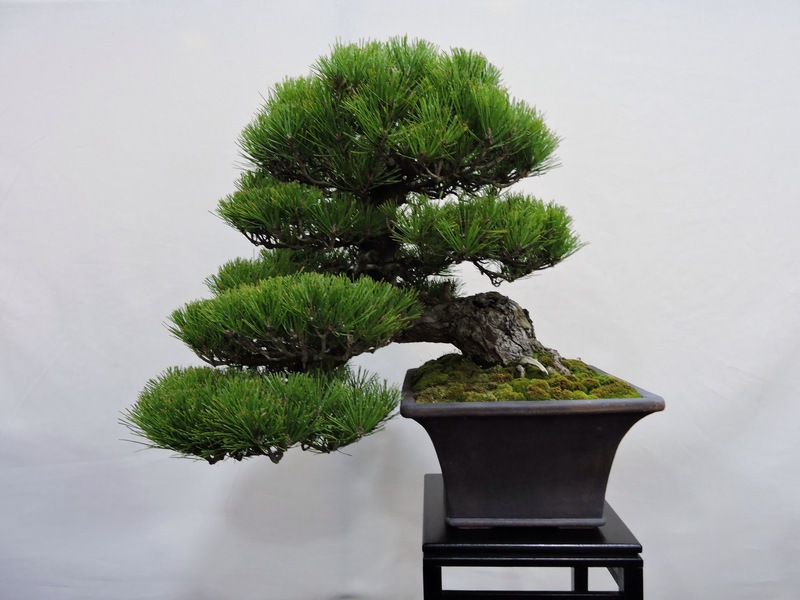 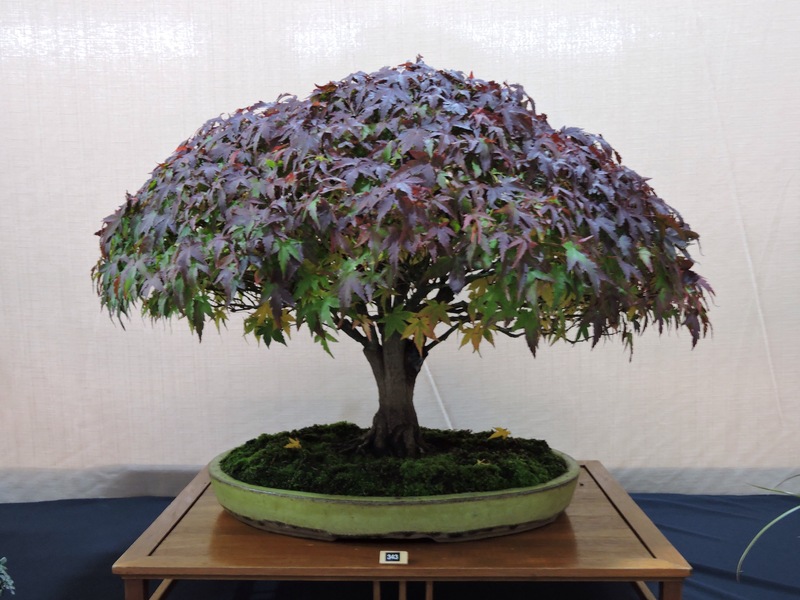 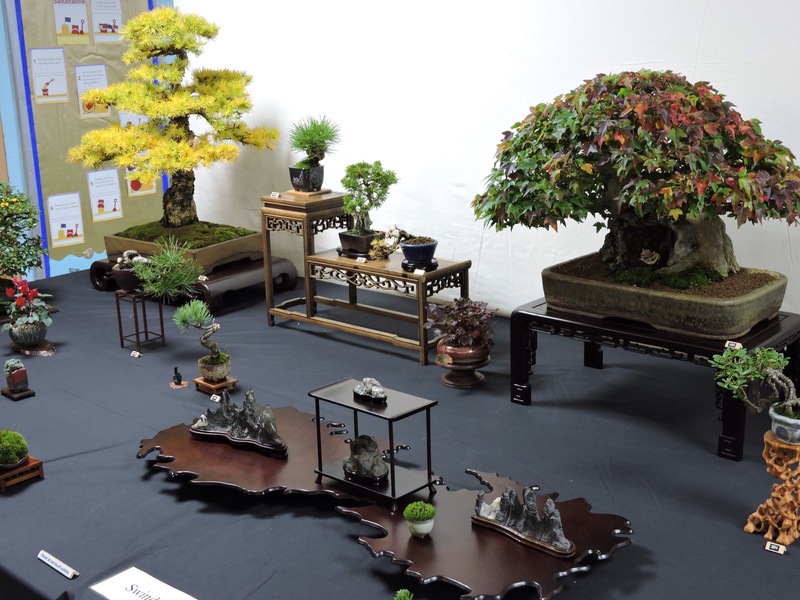 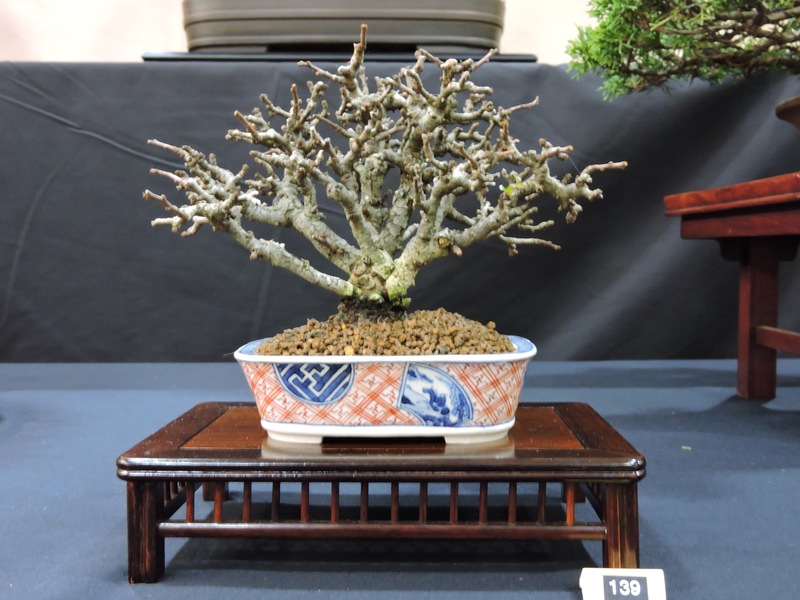 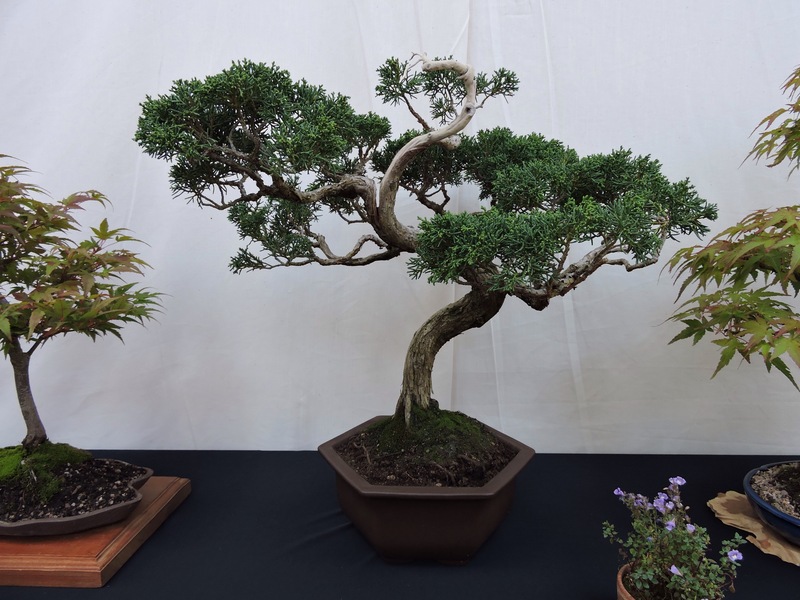 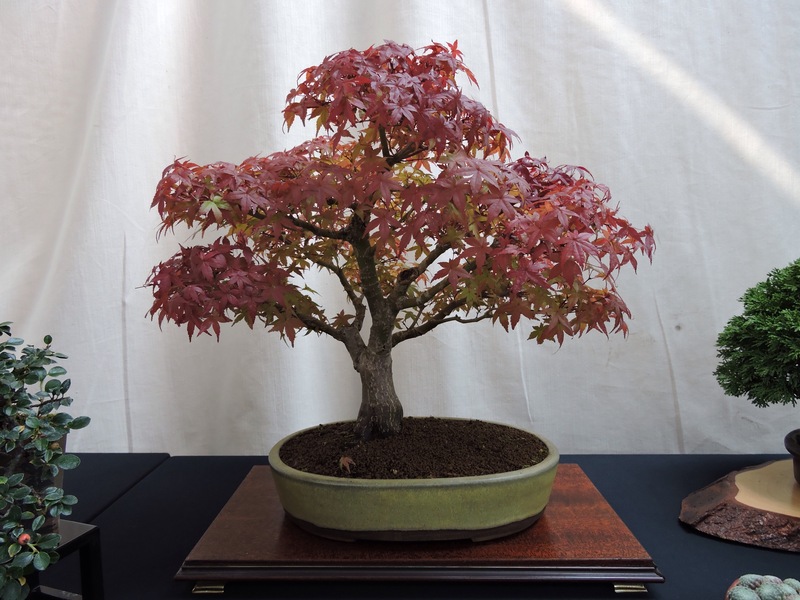 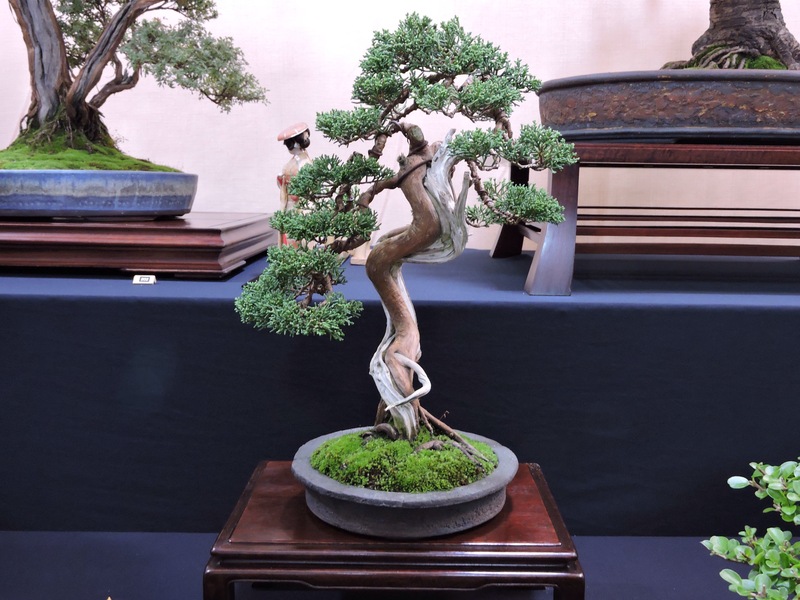 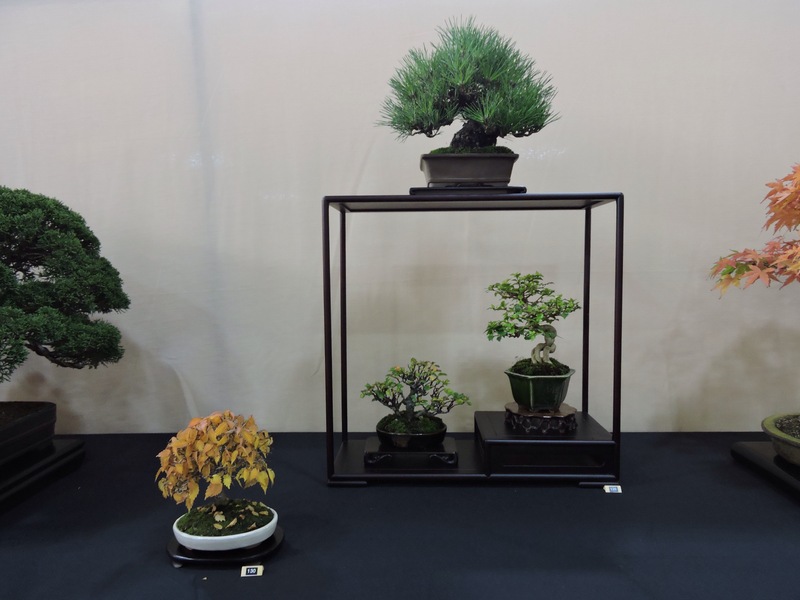 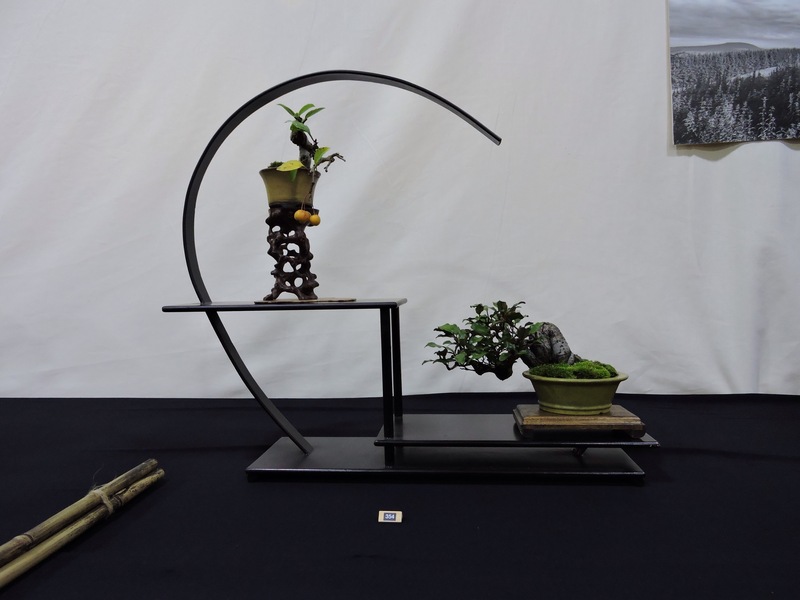 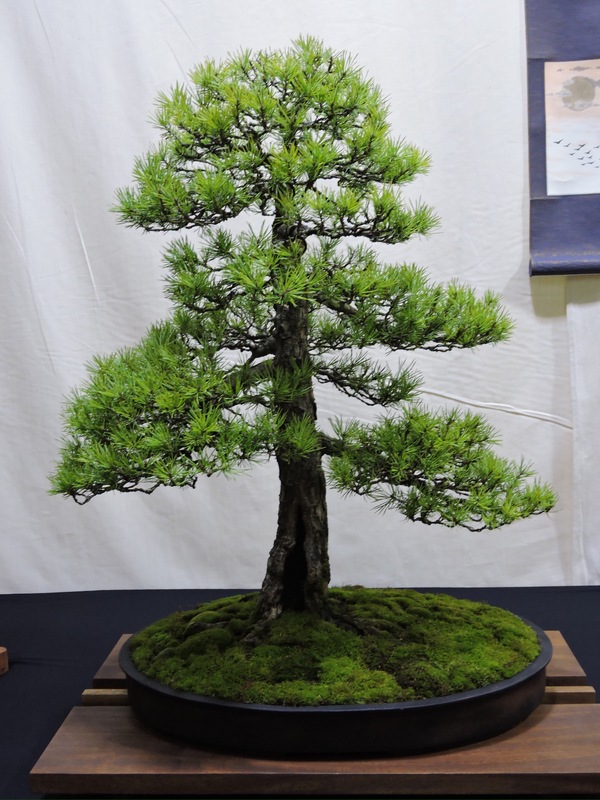 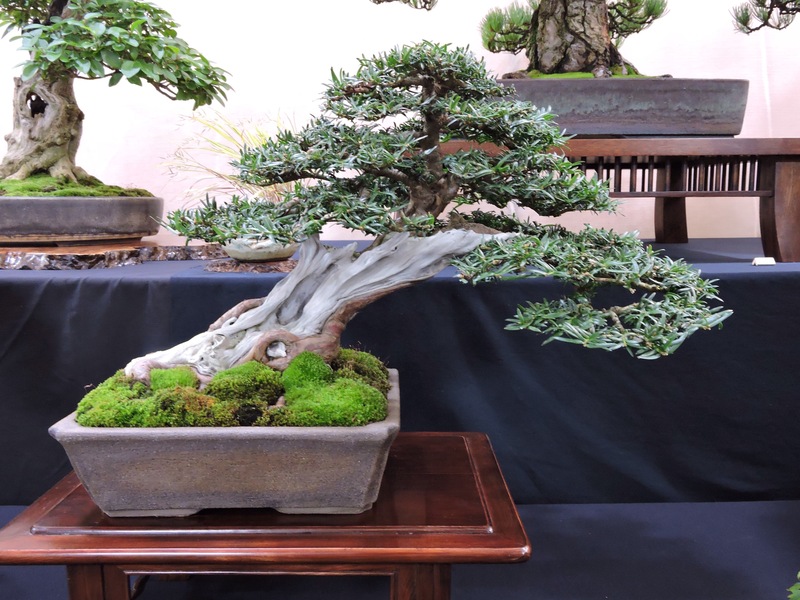 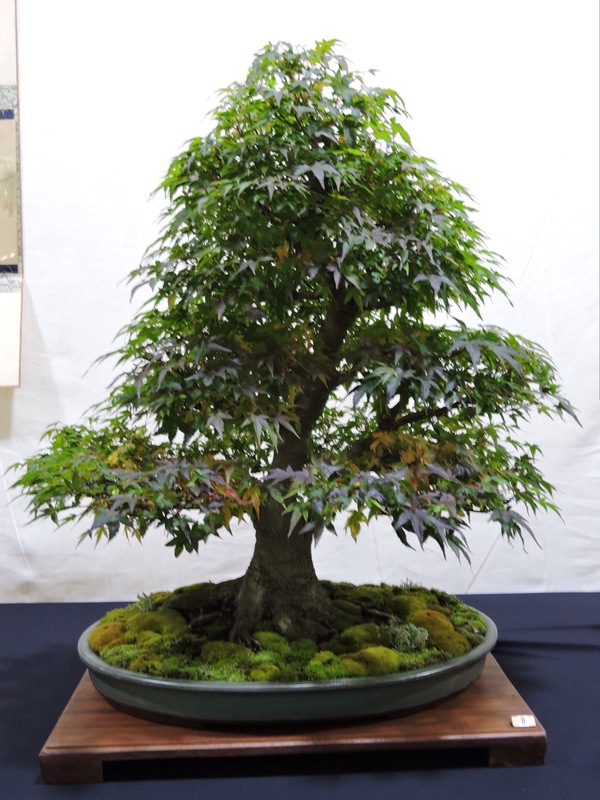 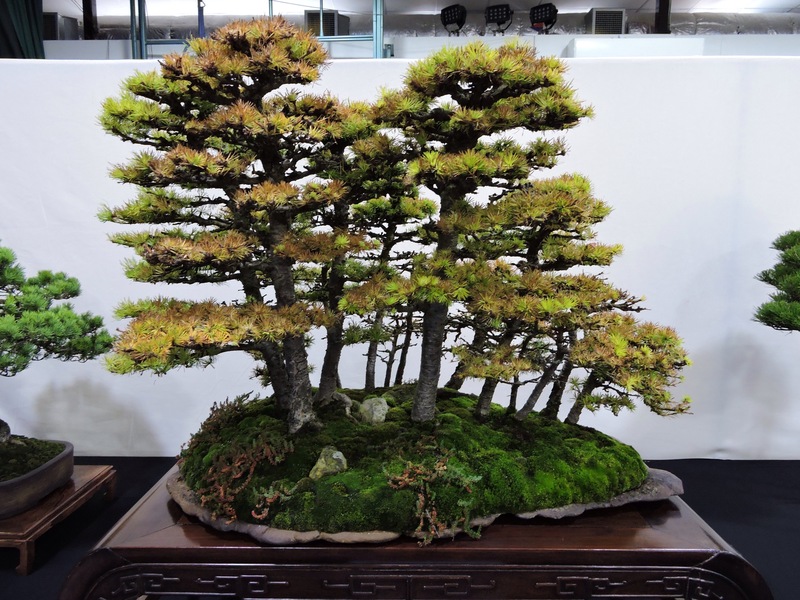 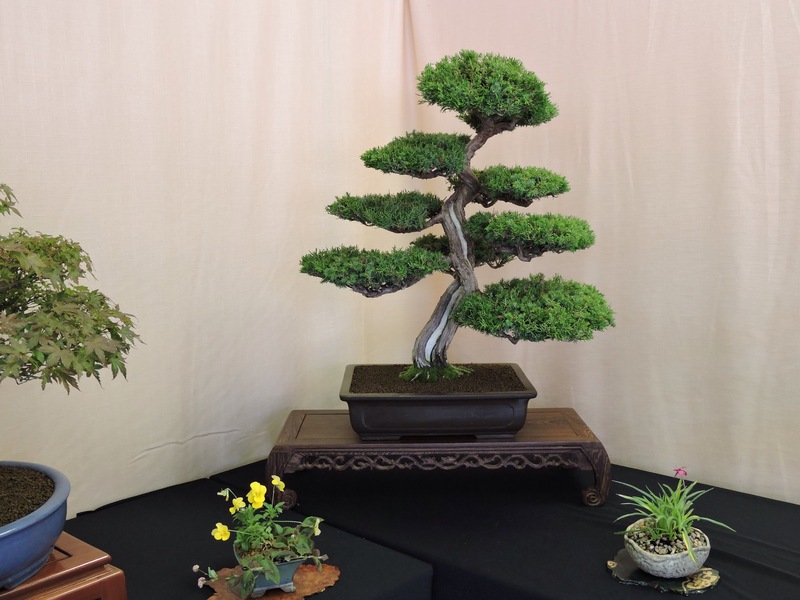 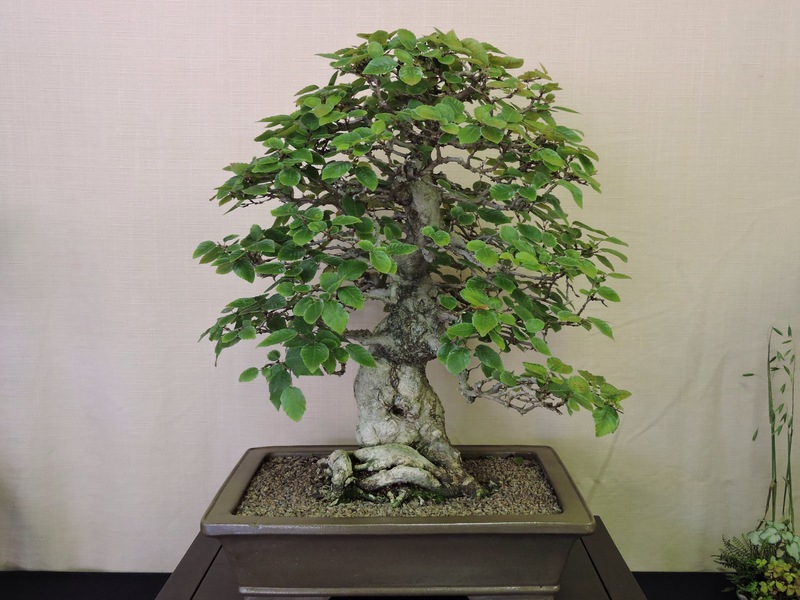 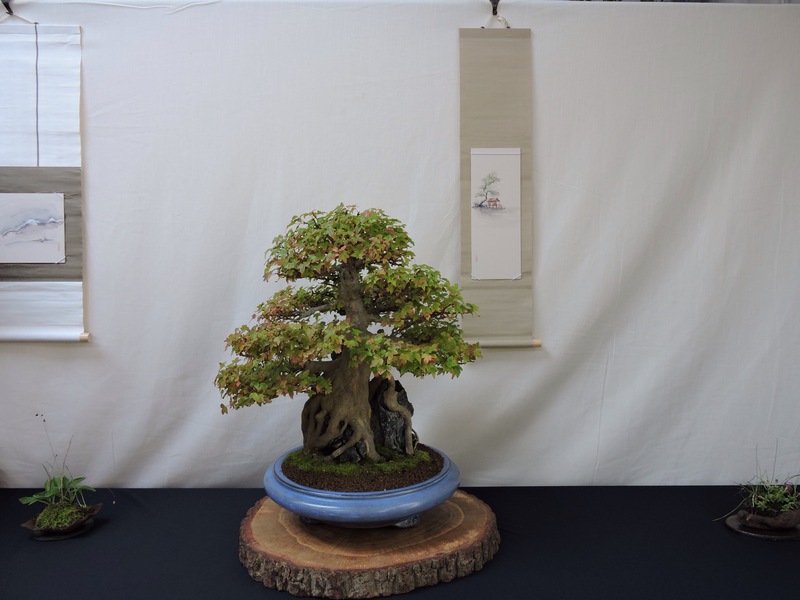 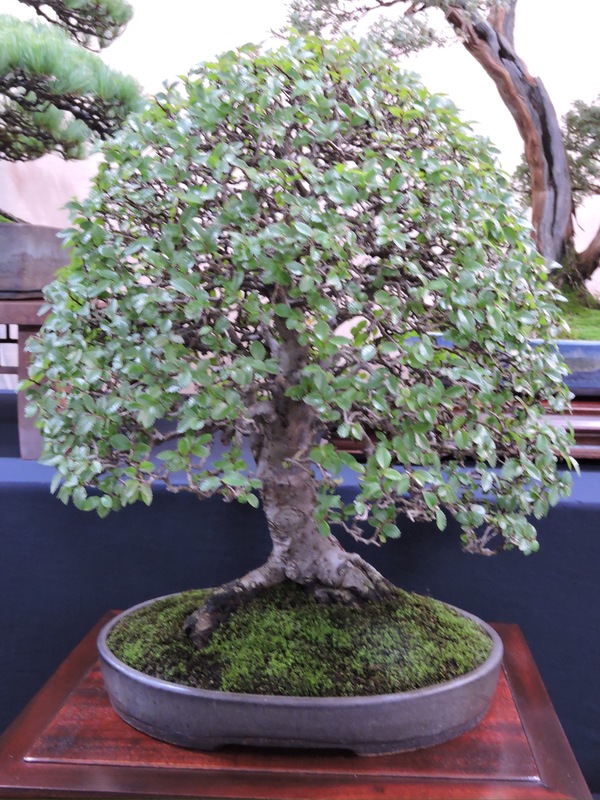 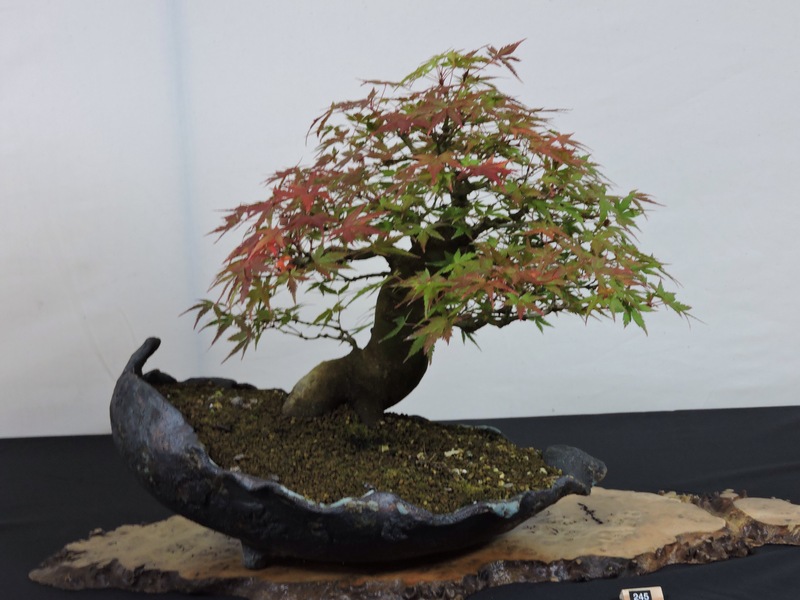 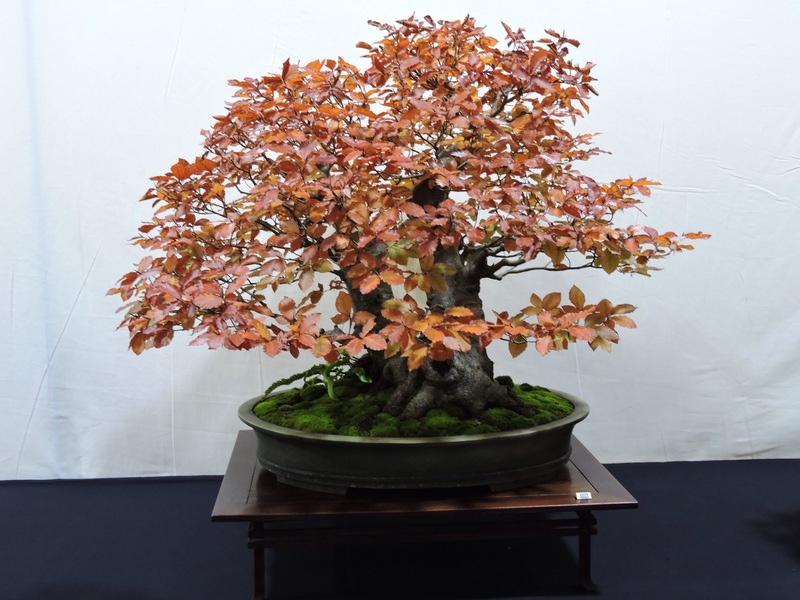 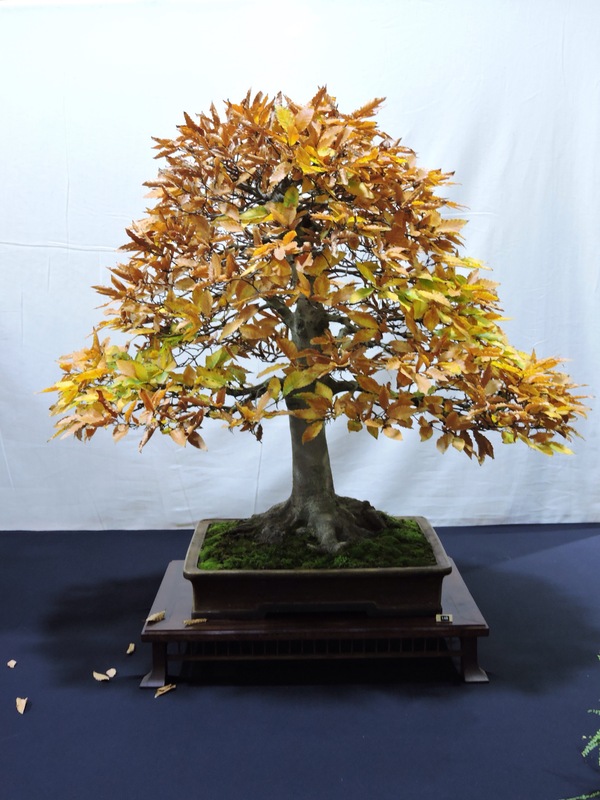 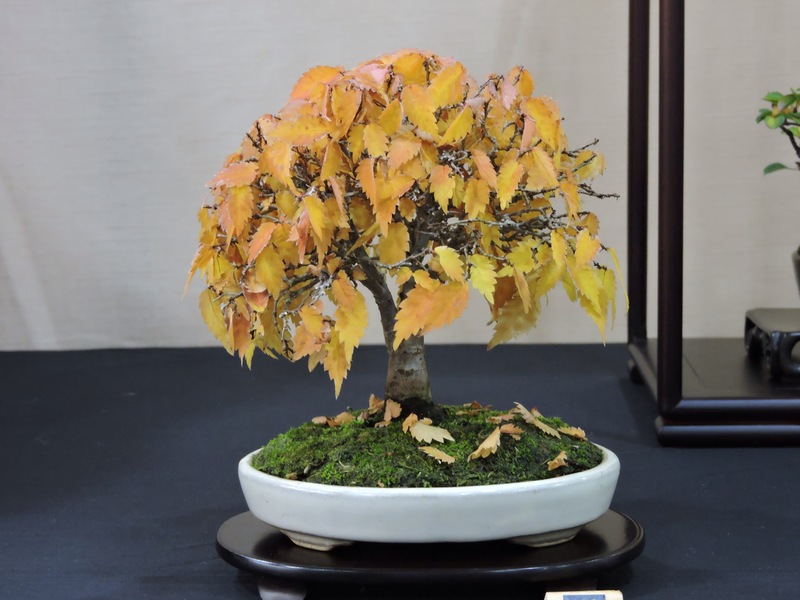 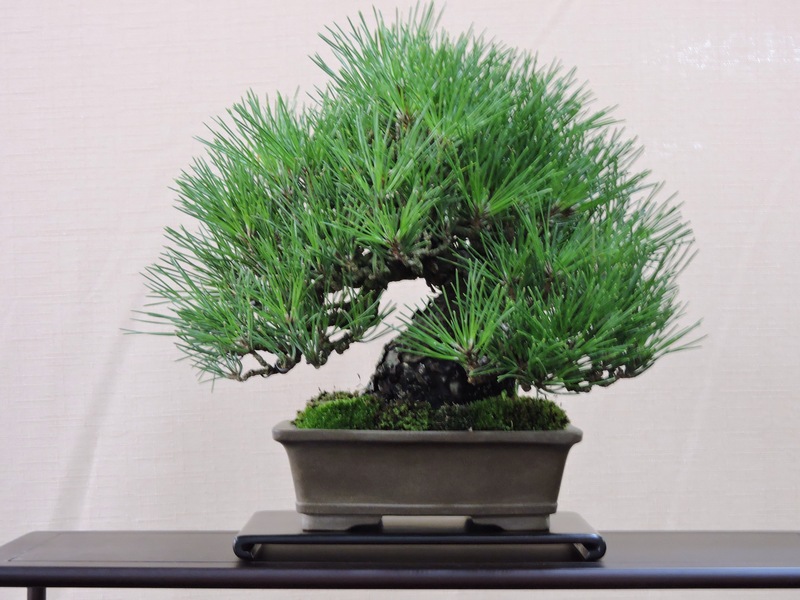 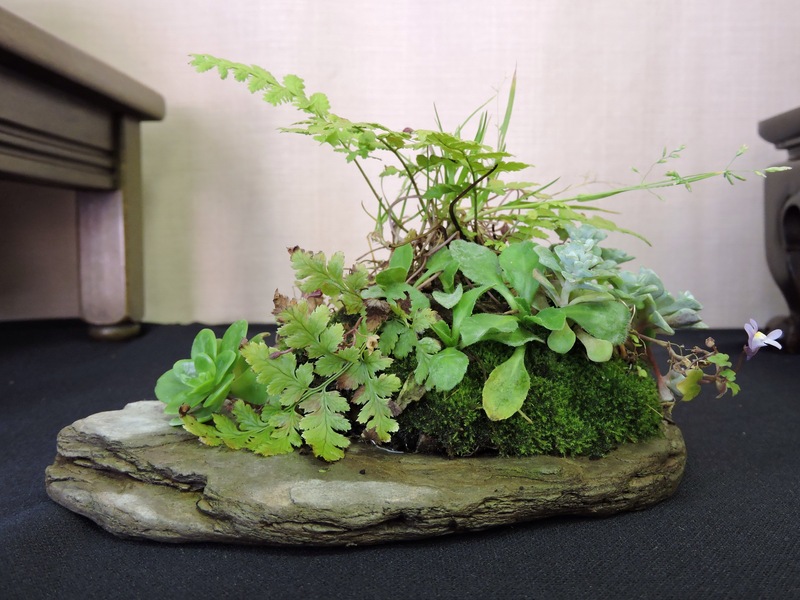 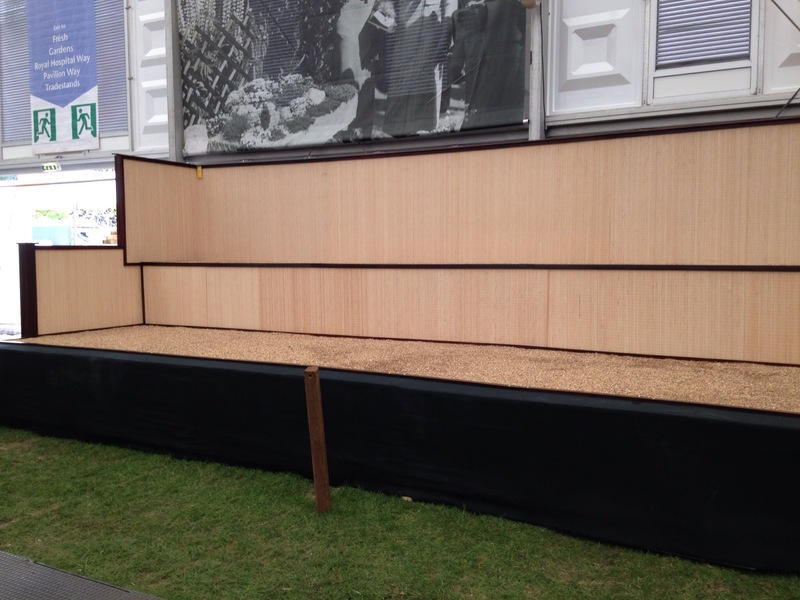 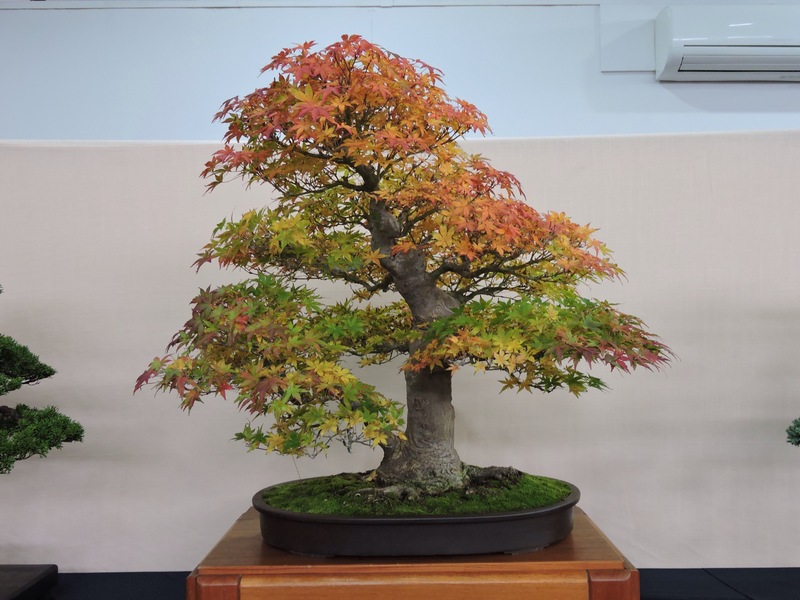 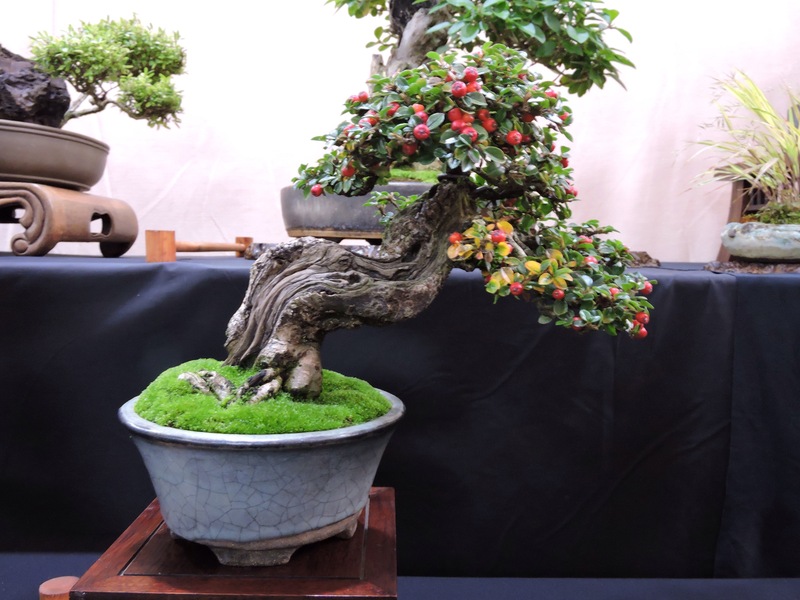 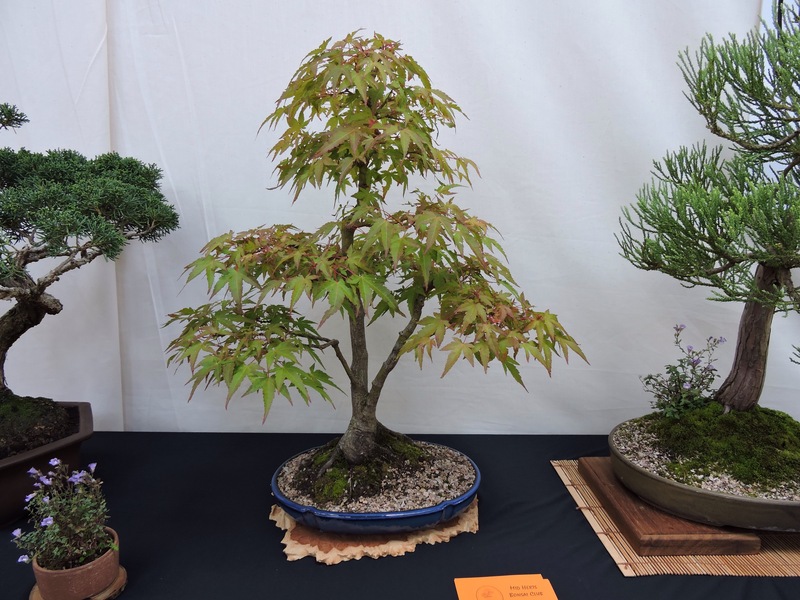 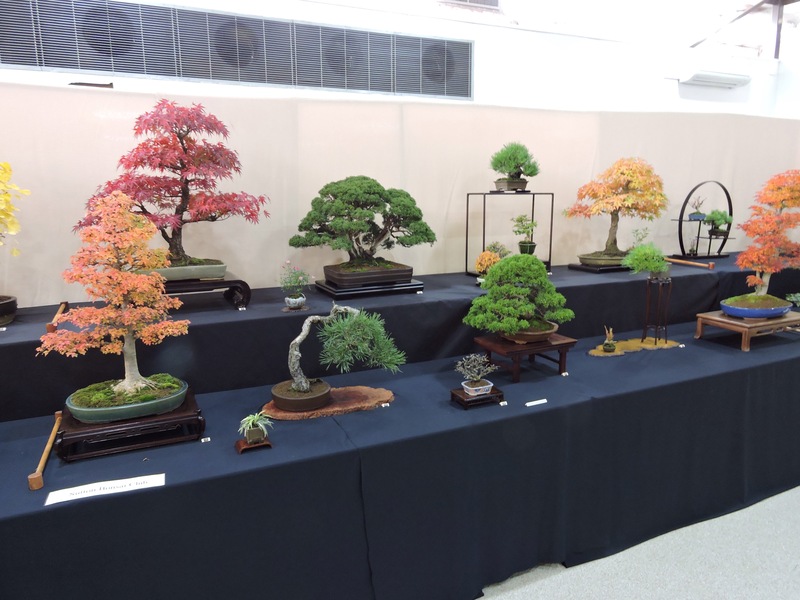 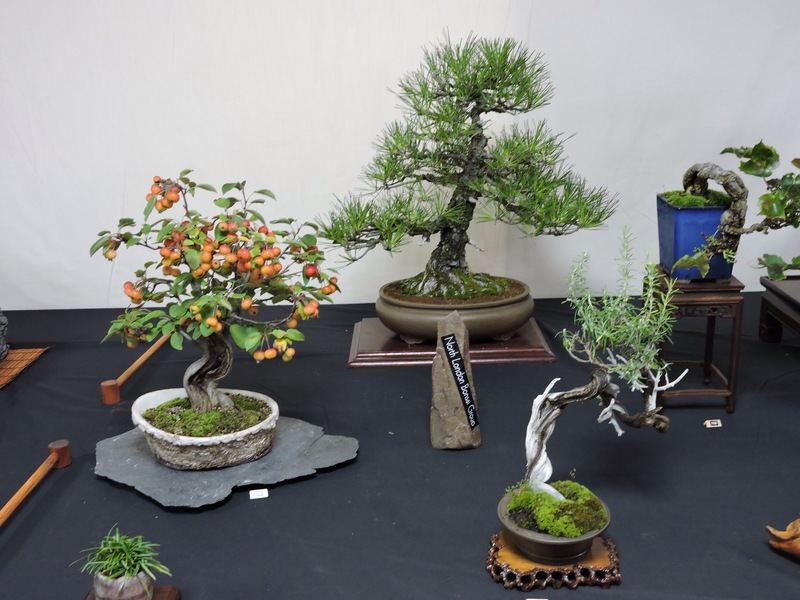 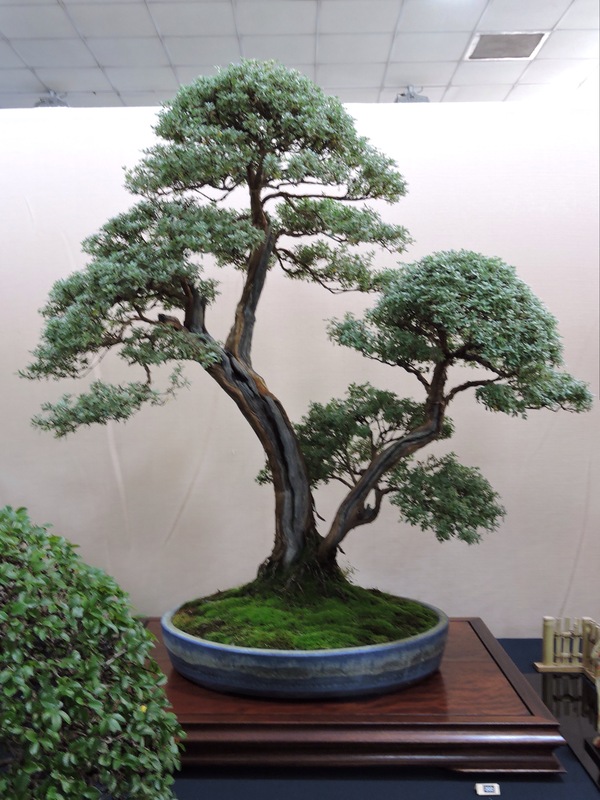 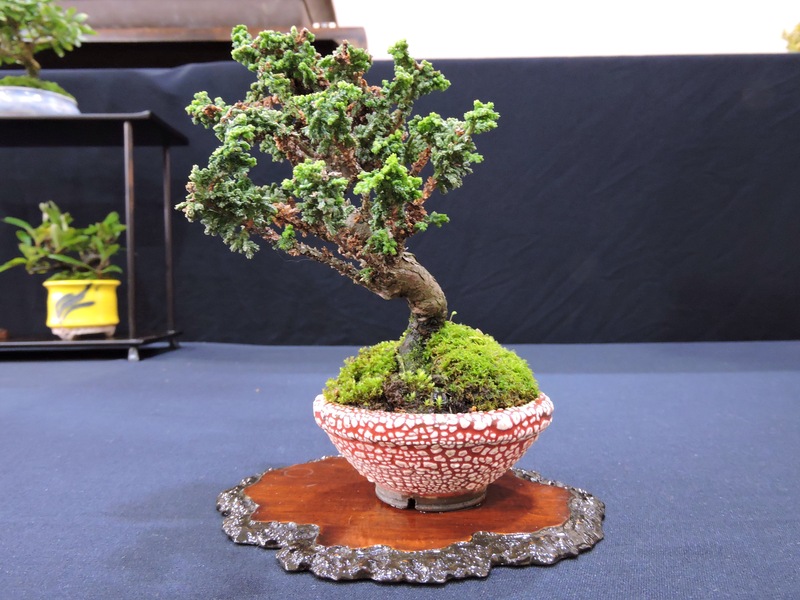 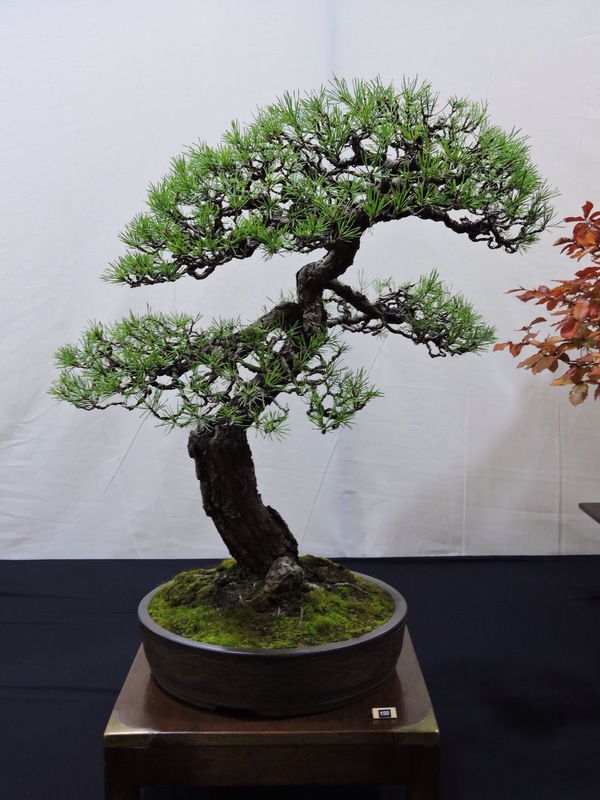 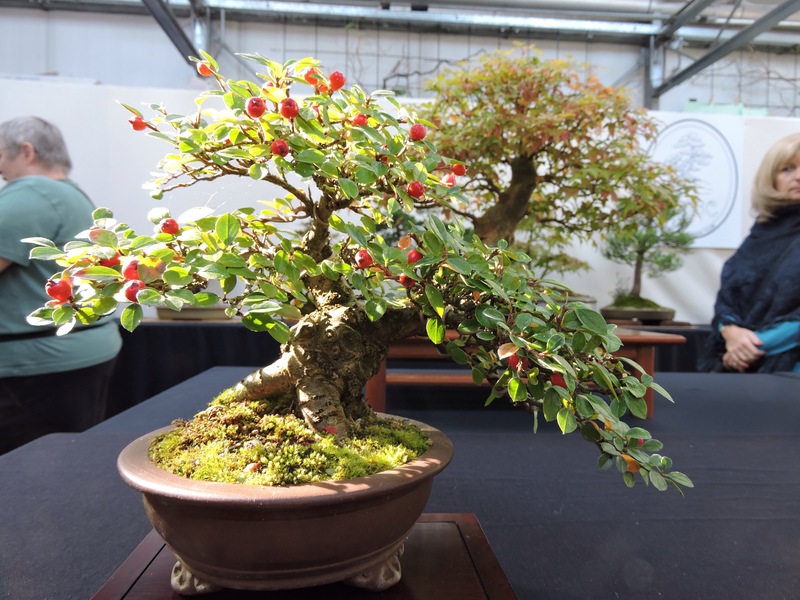 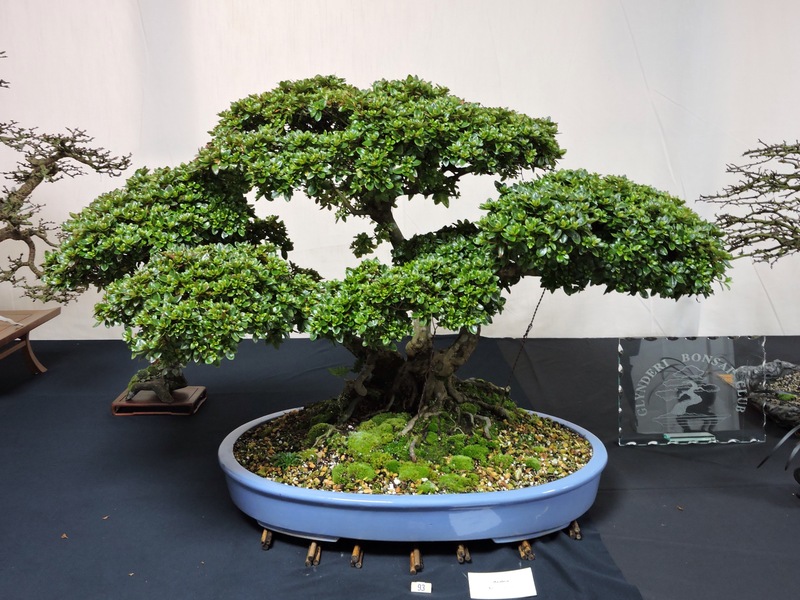 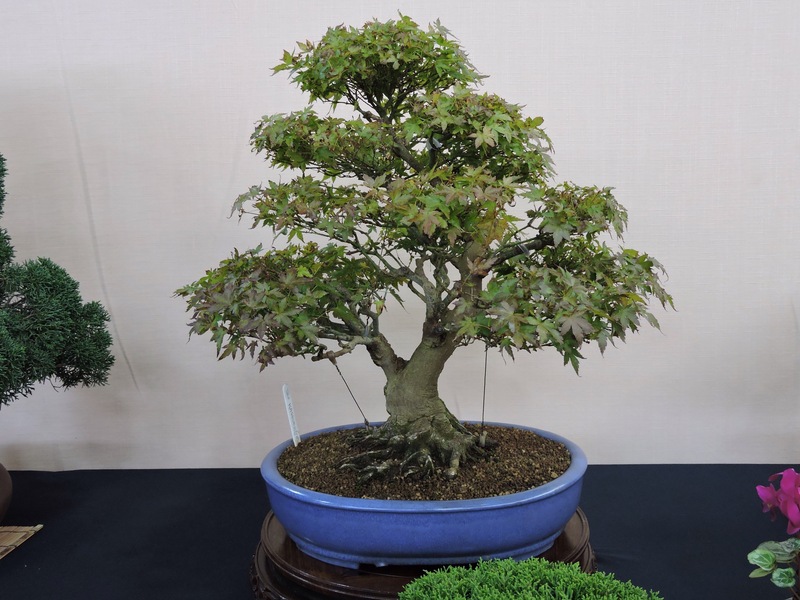 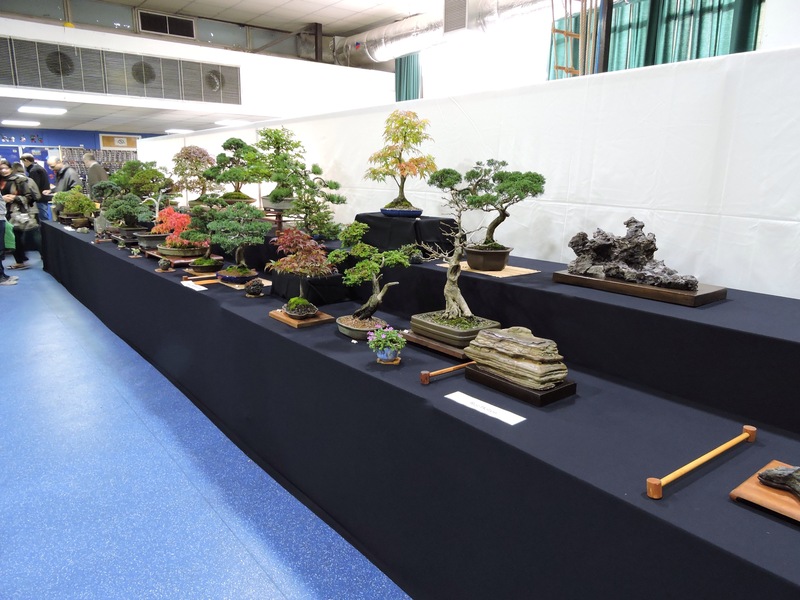 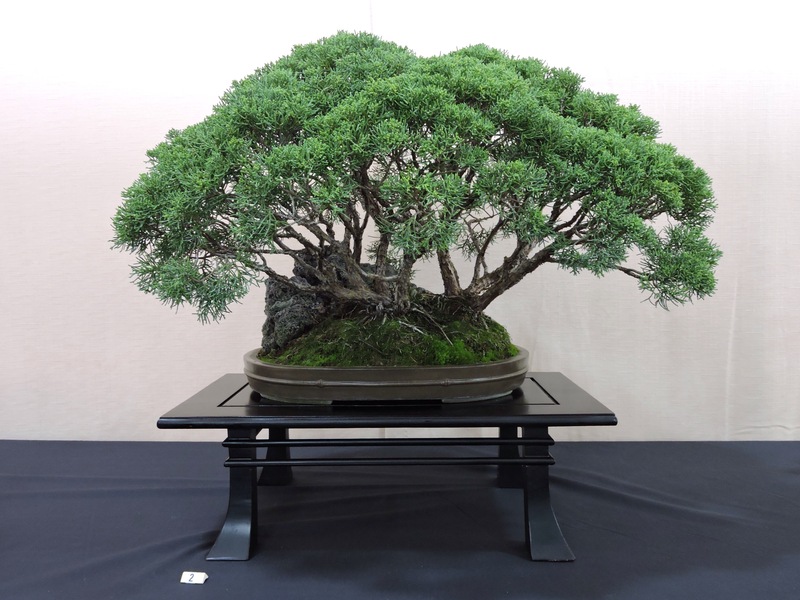 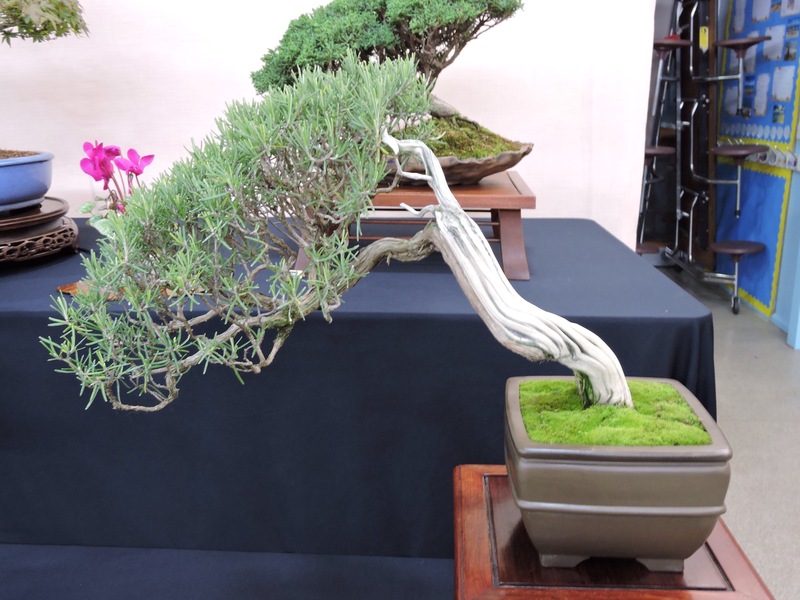 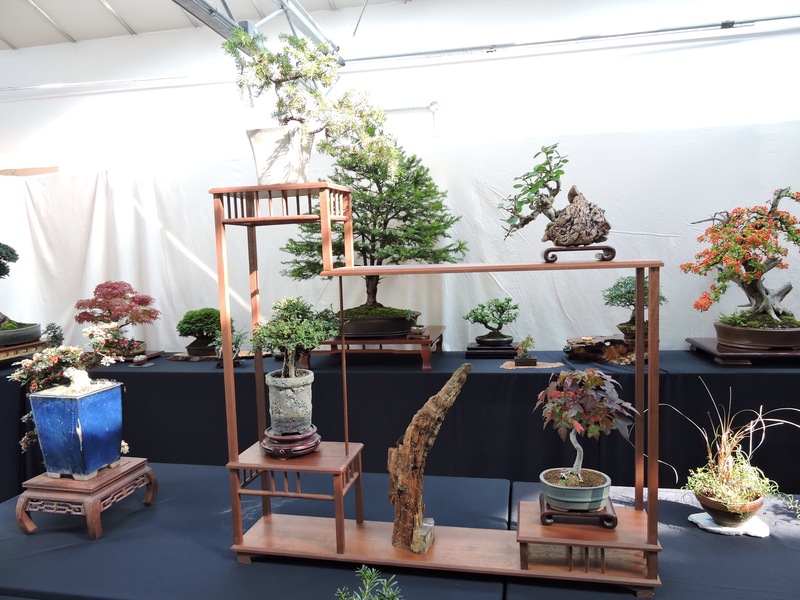 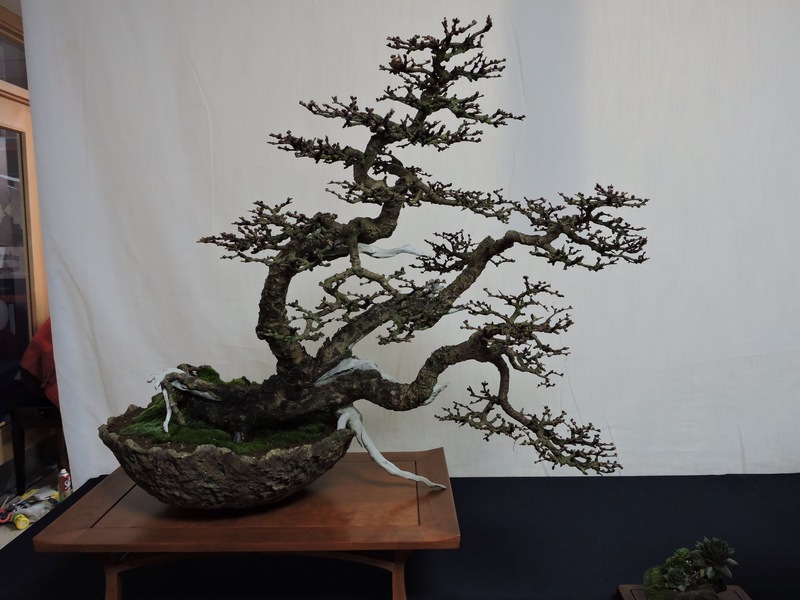 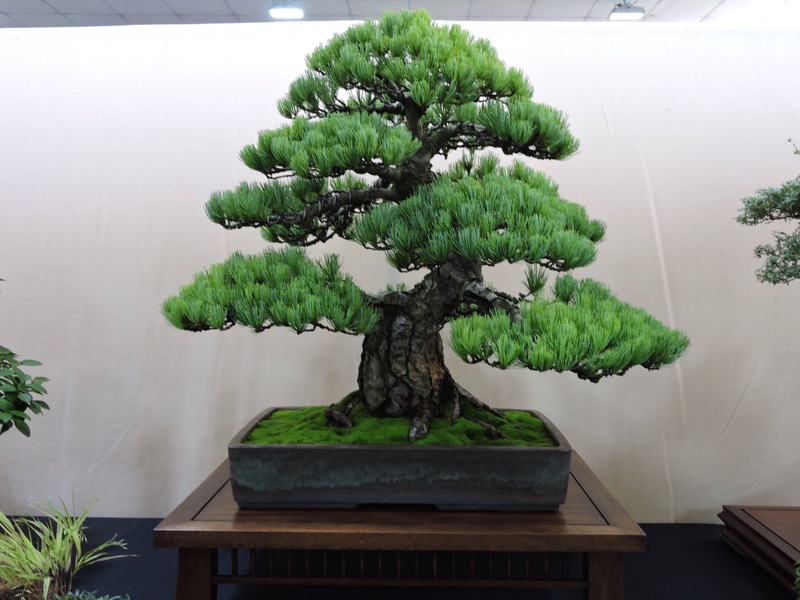 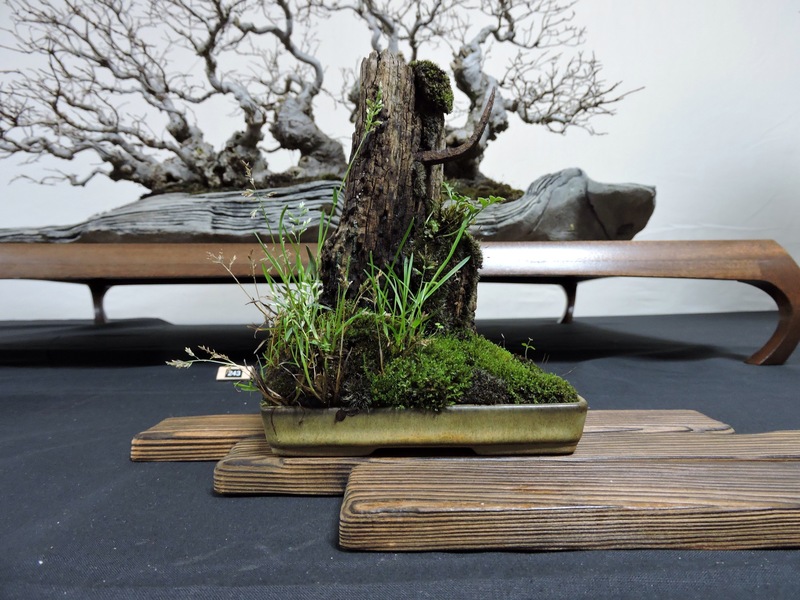 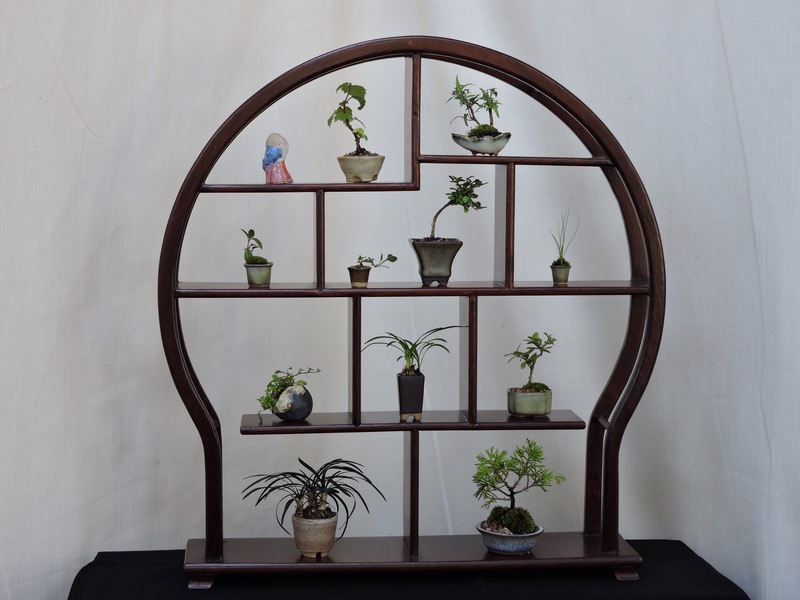 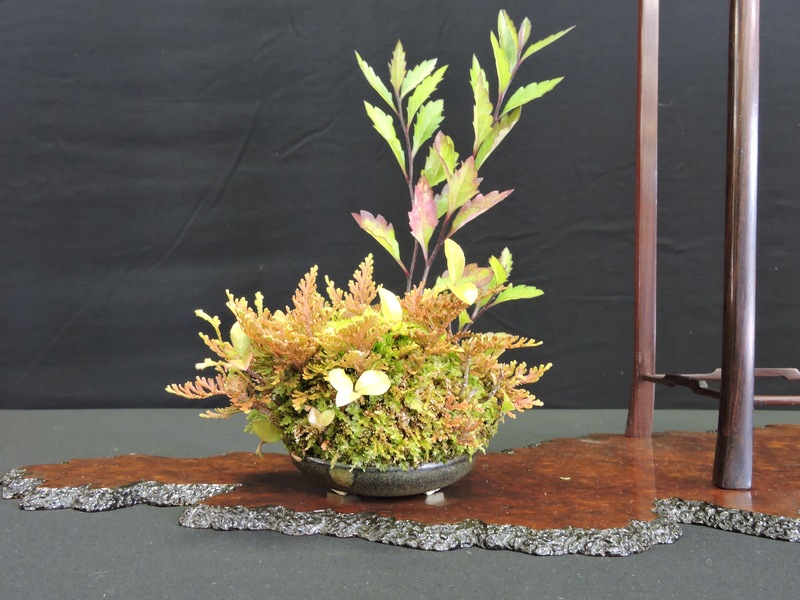 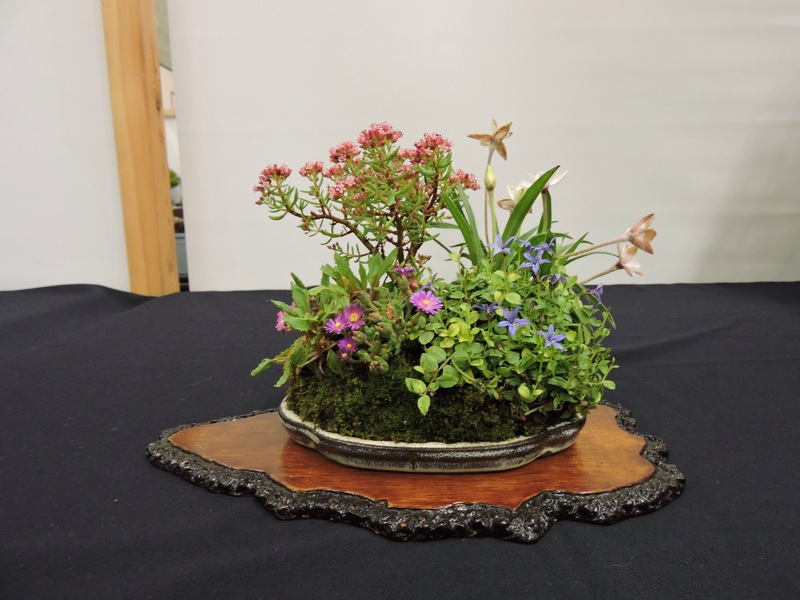 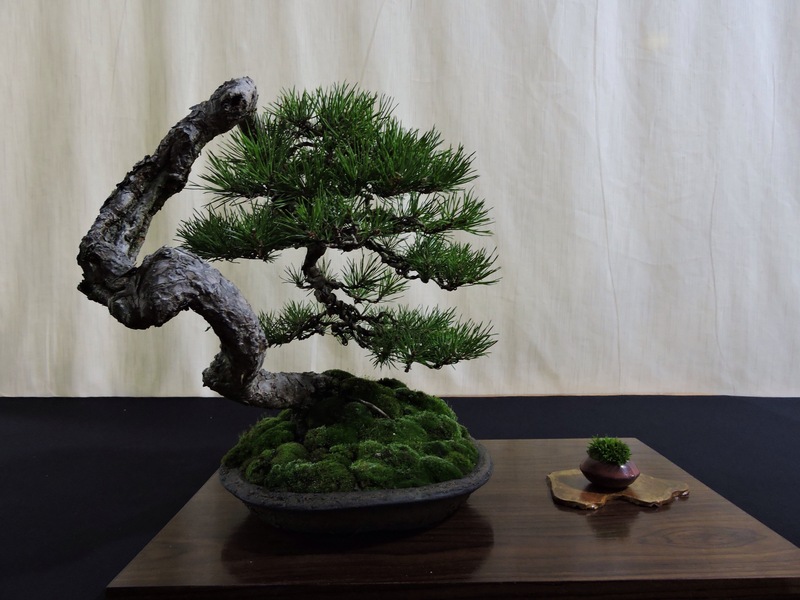 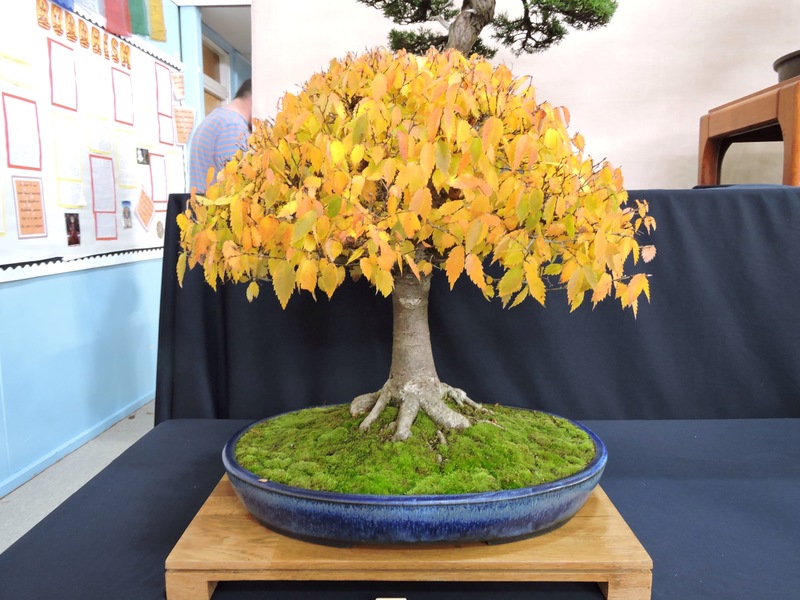 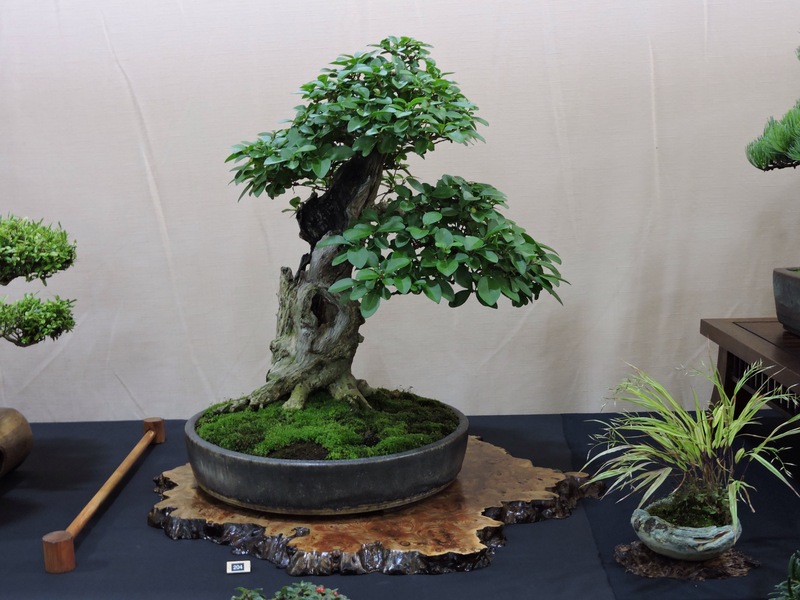 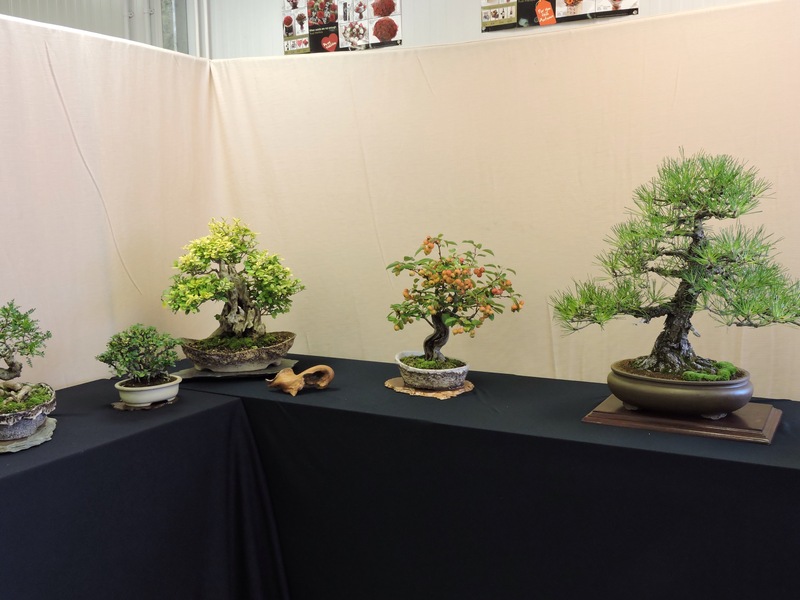 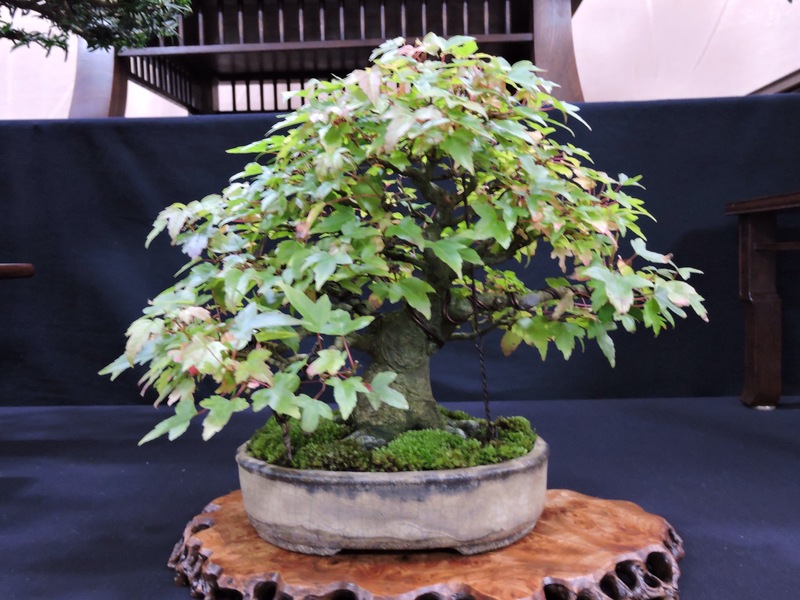 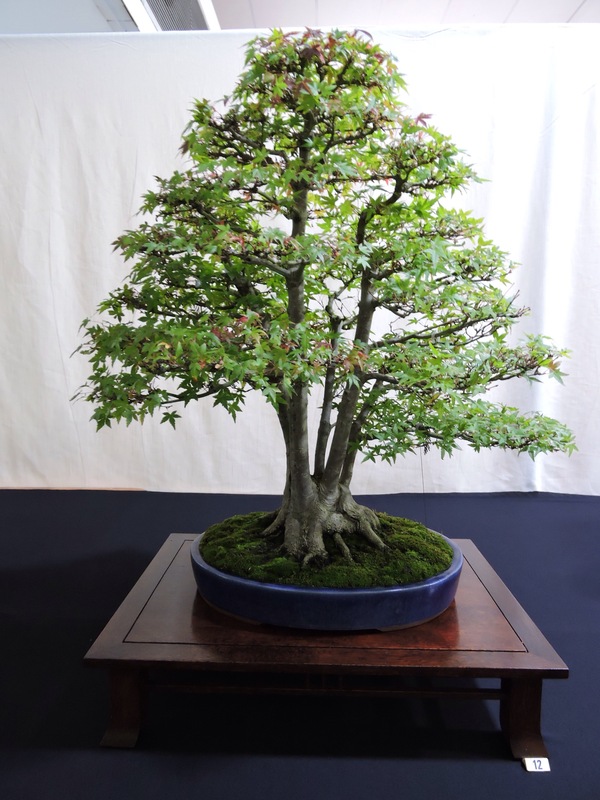 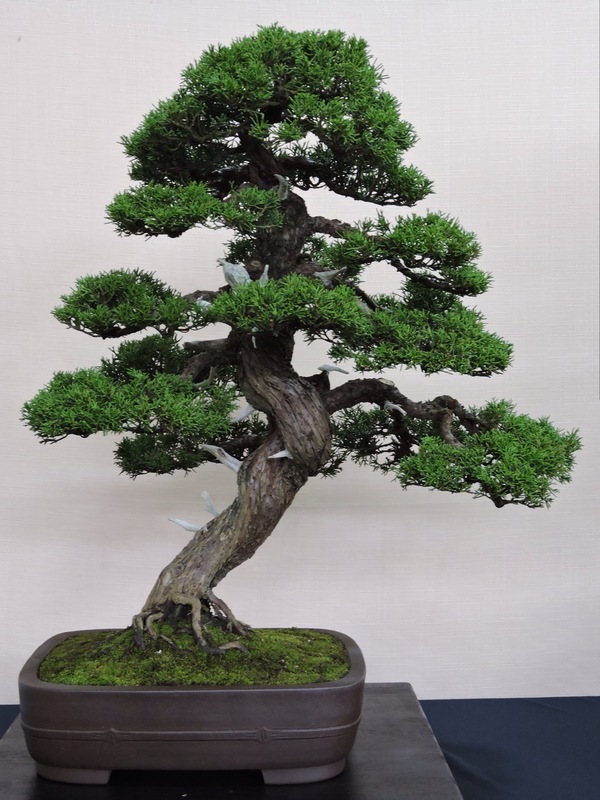 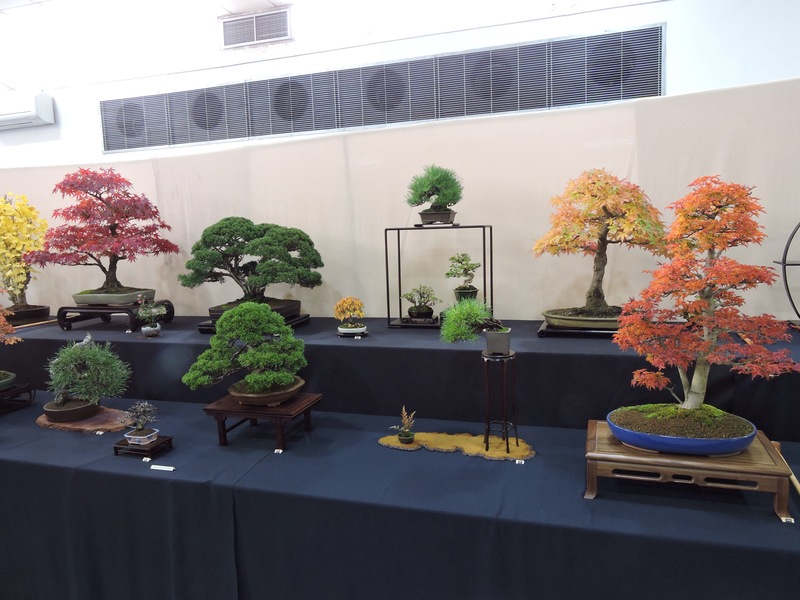 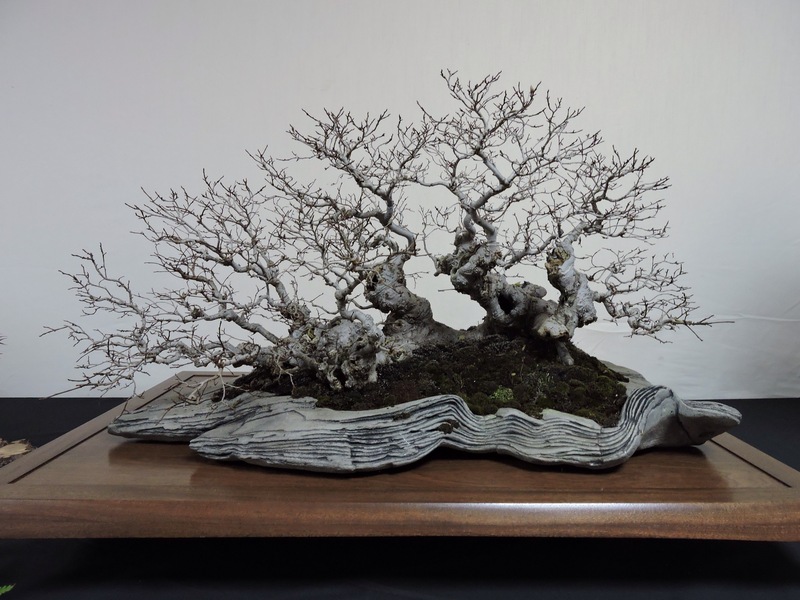 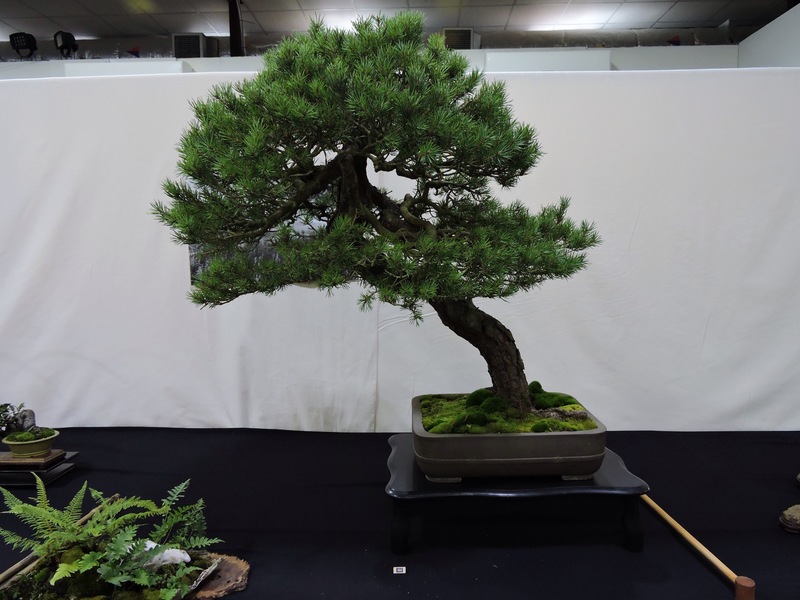 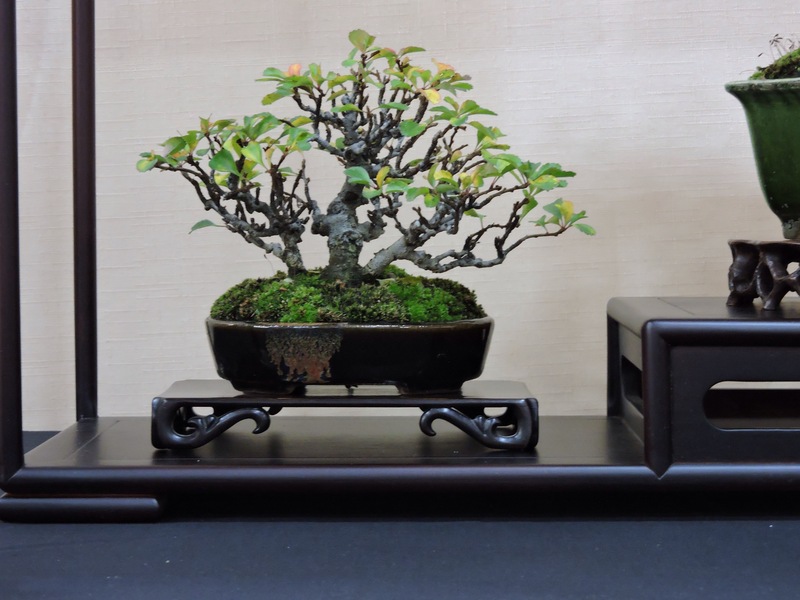 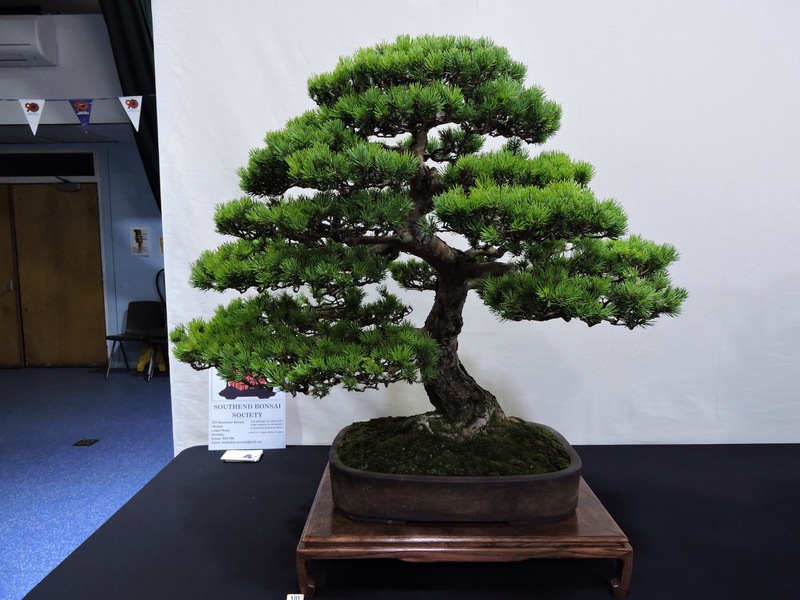 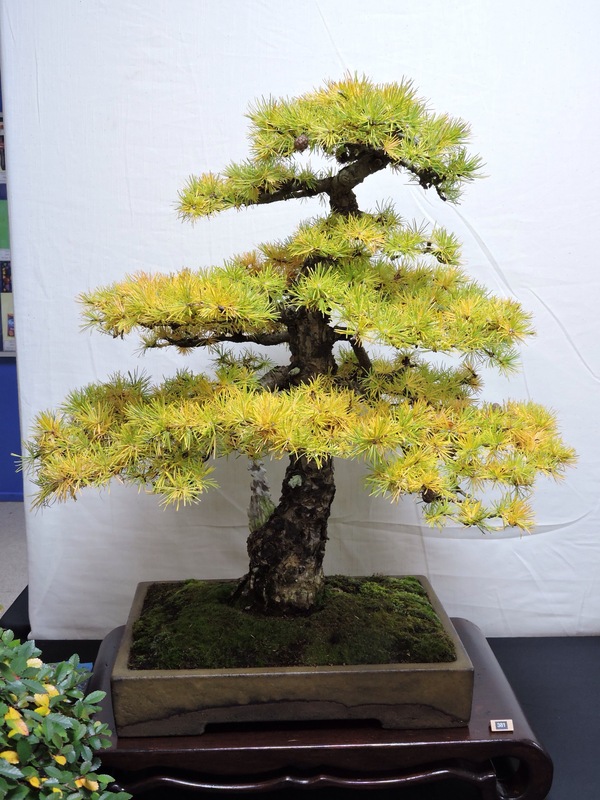 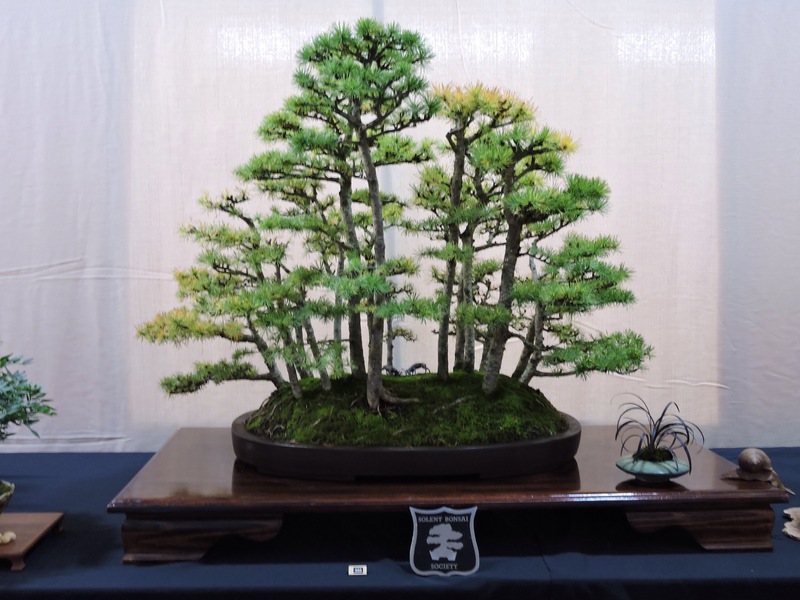 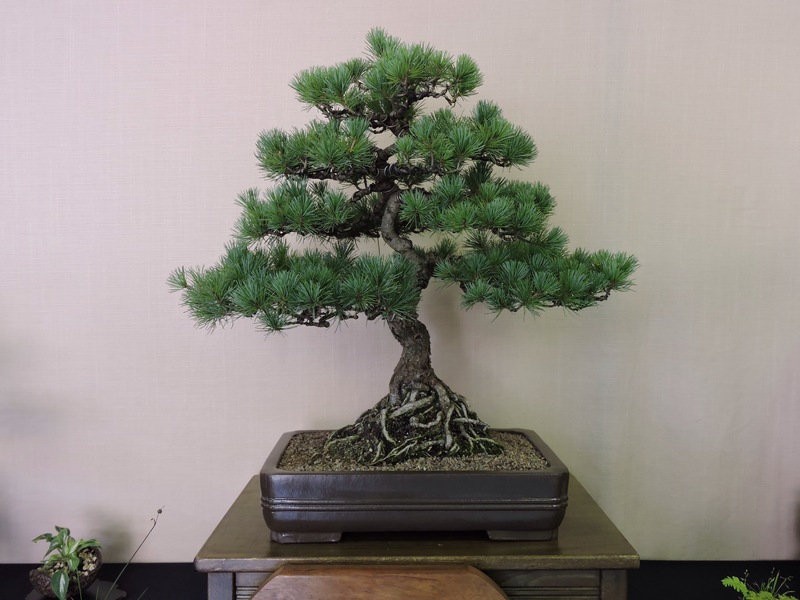 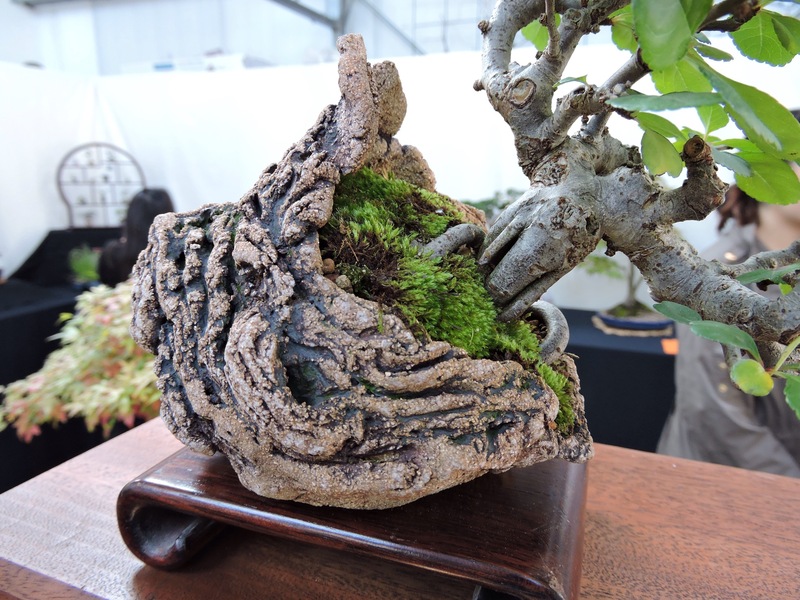 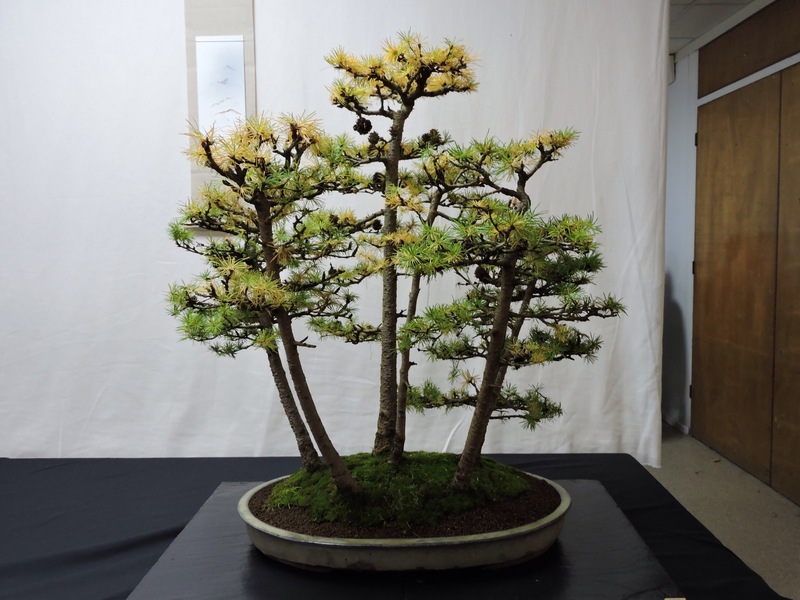 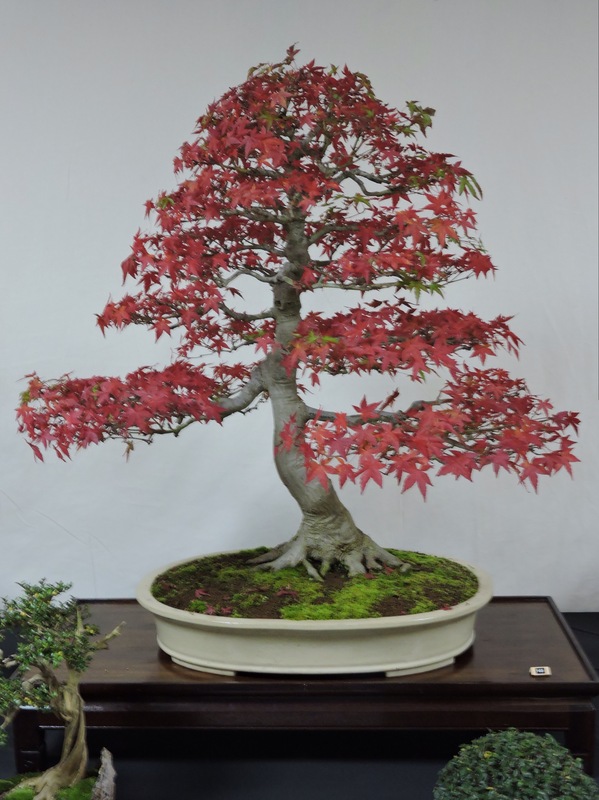 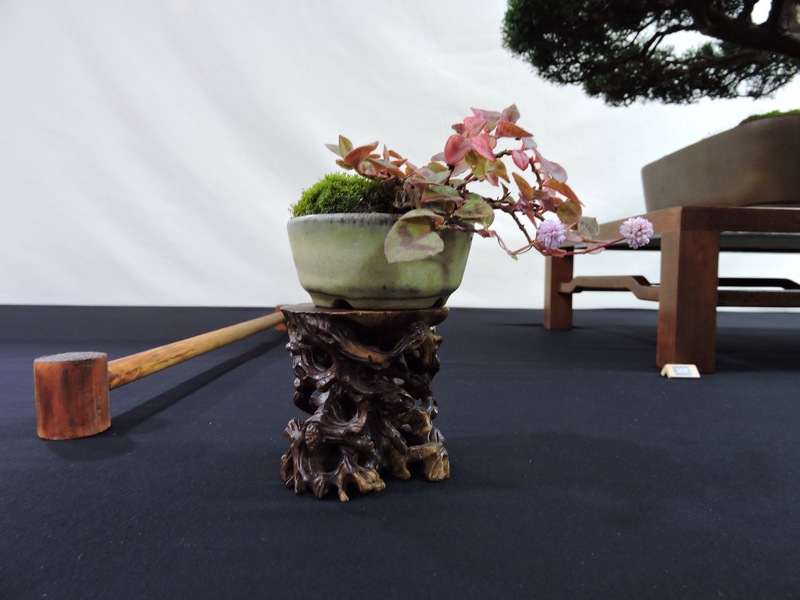 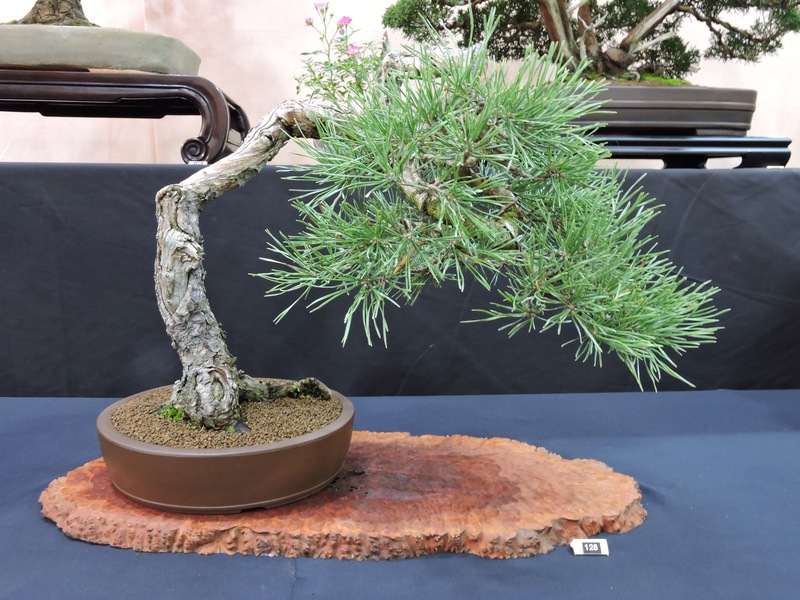 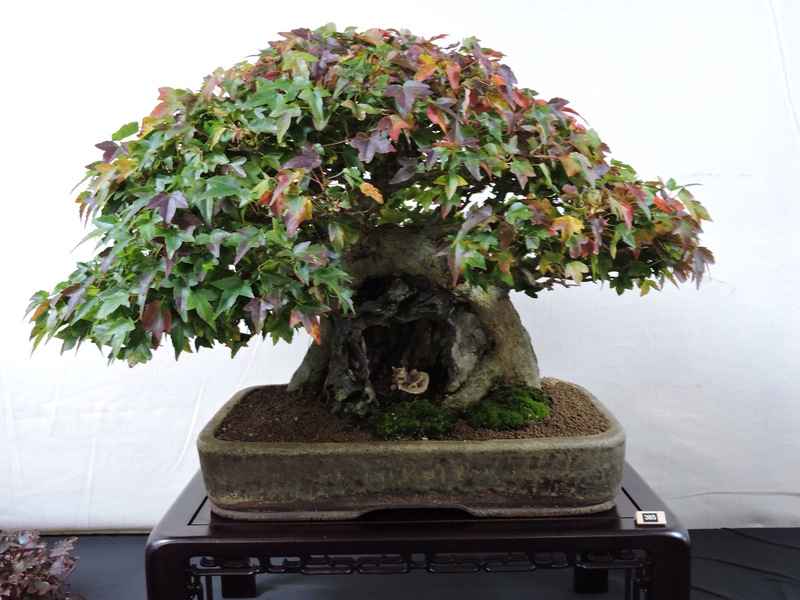 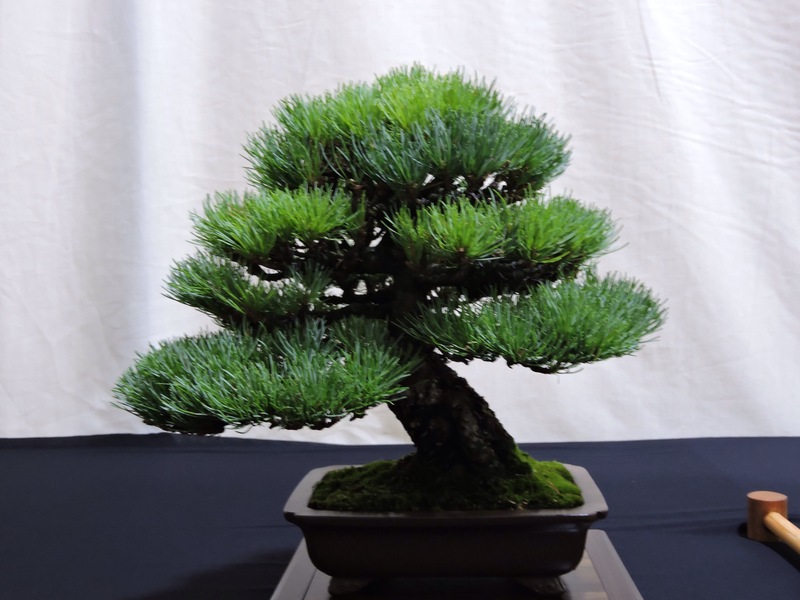 Friday is the first day that Reg and his team from around the FOBBS clubs set up the stand at the famous Chelsea flower show, to promote bonsai to thousands of visitors during the week. 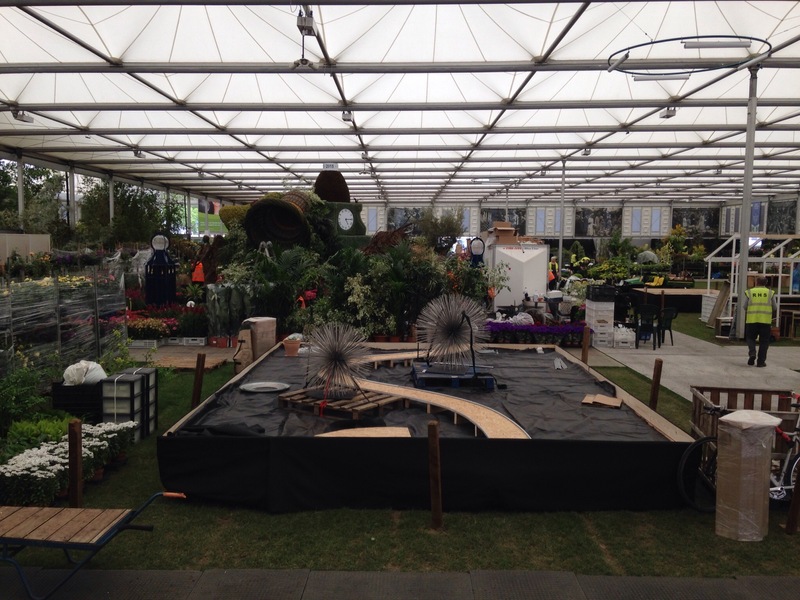 Once we had worked out where we were located inside the floral marquee, having not realised our stand number was on the pass we were wearing! 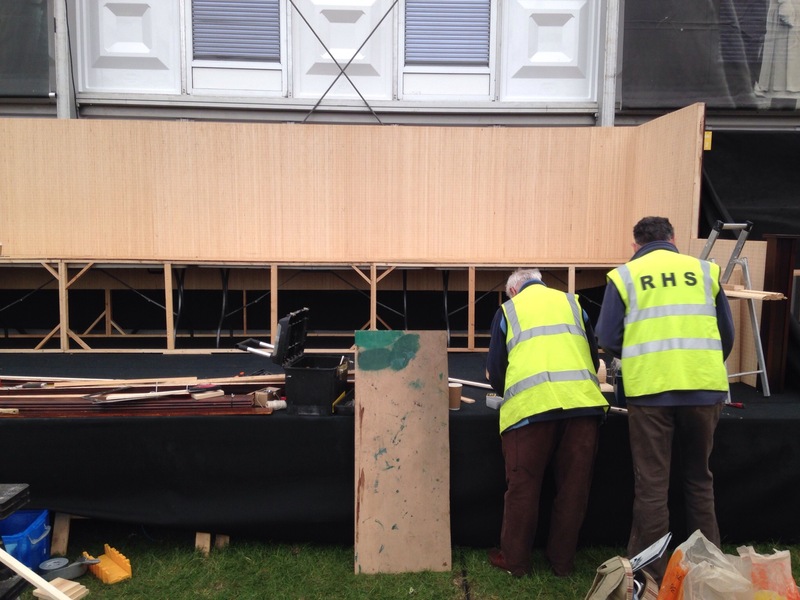 We were happy to see the stand was quite level which would help greatly. 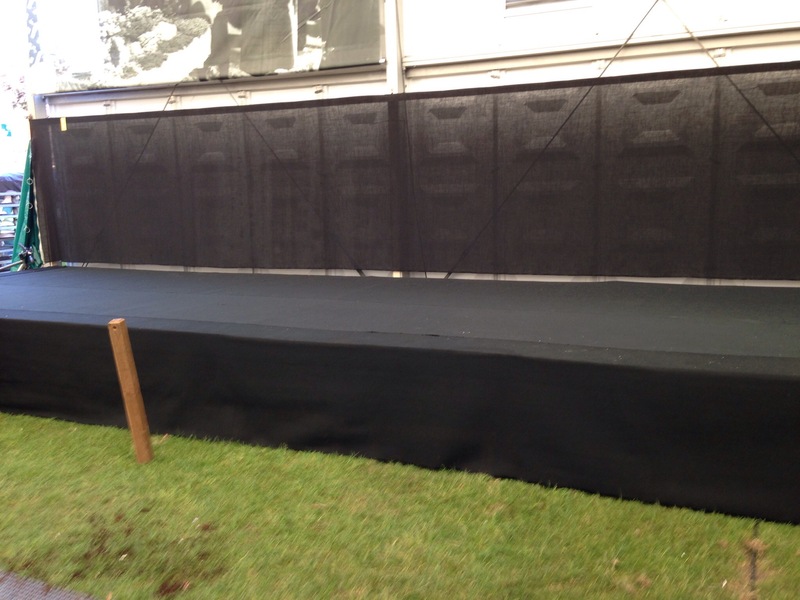 This is our view up on the stand looking out over the marquee. 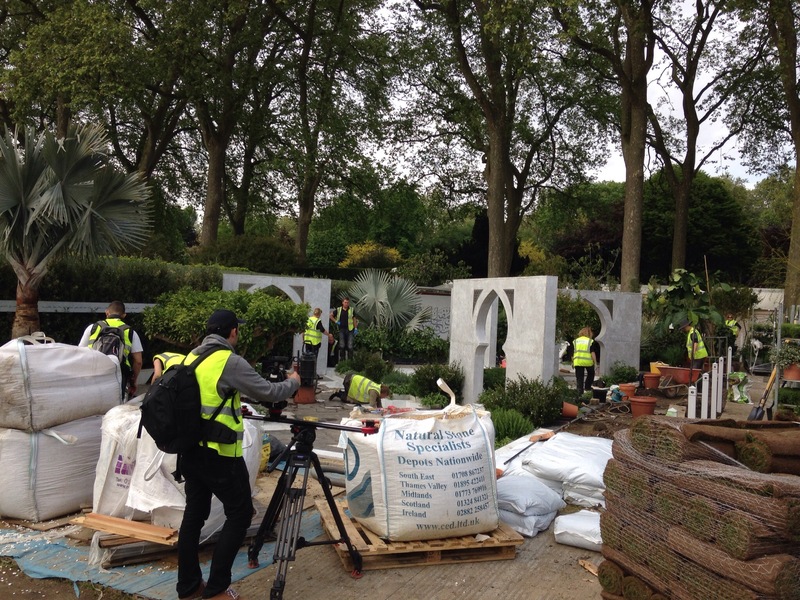 So on with the build and good progress up to lunch time. 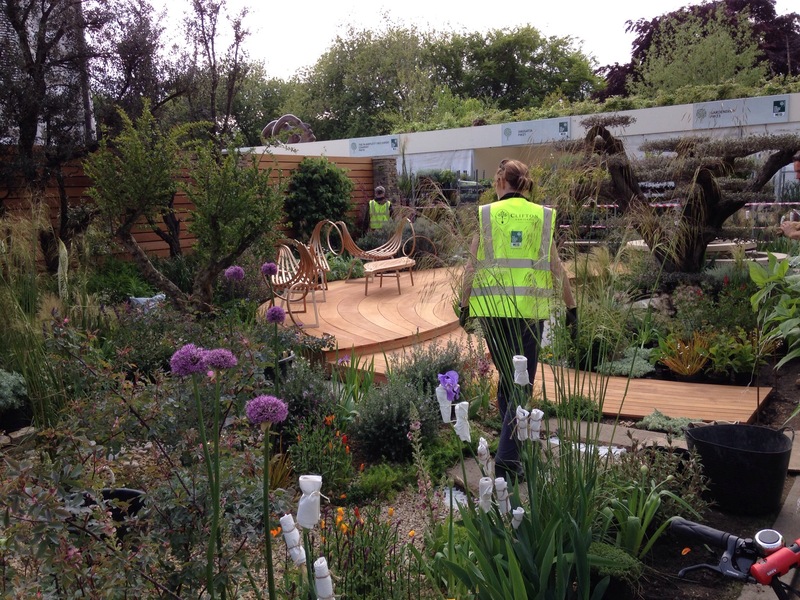 After a quick pitstop it was on with getting the edging timbers in that crisp up the finish. 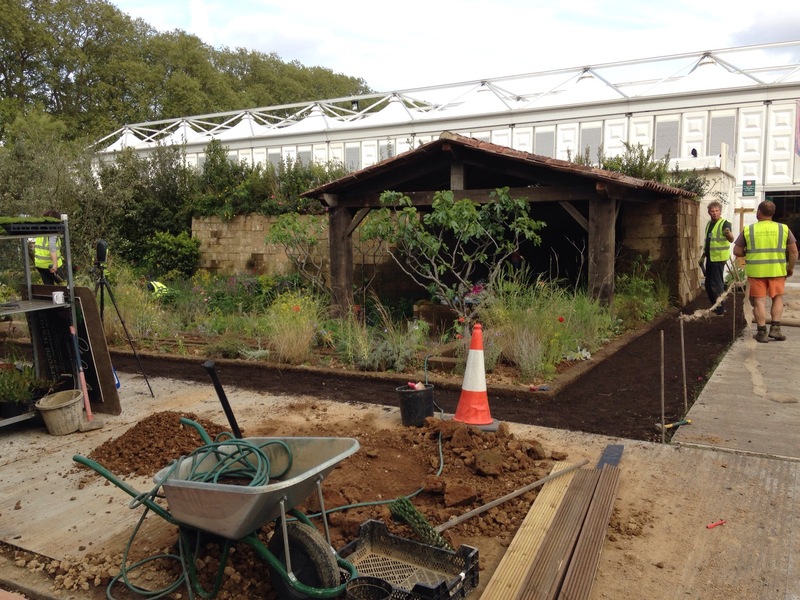 By the end of the day we had the gravel in place and all in the right bits in the right places. 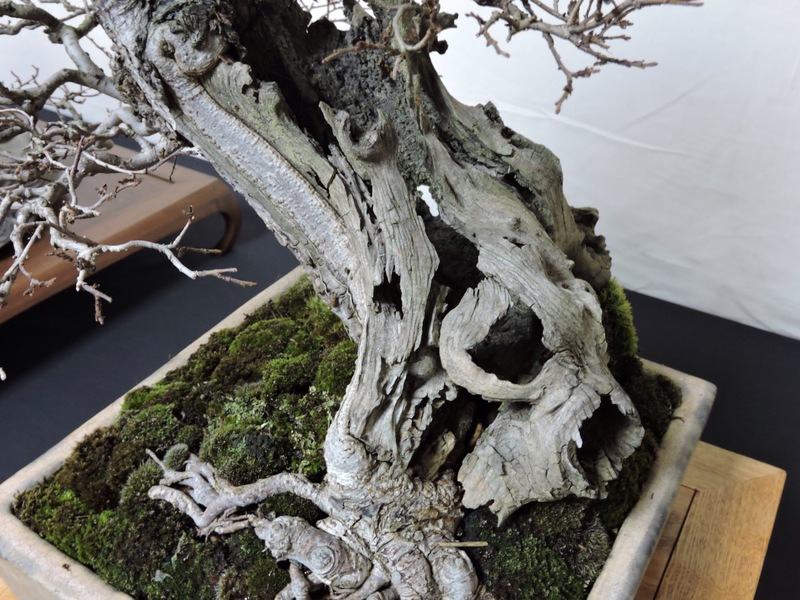 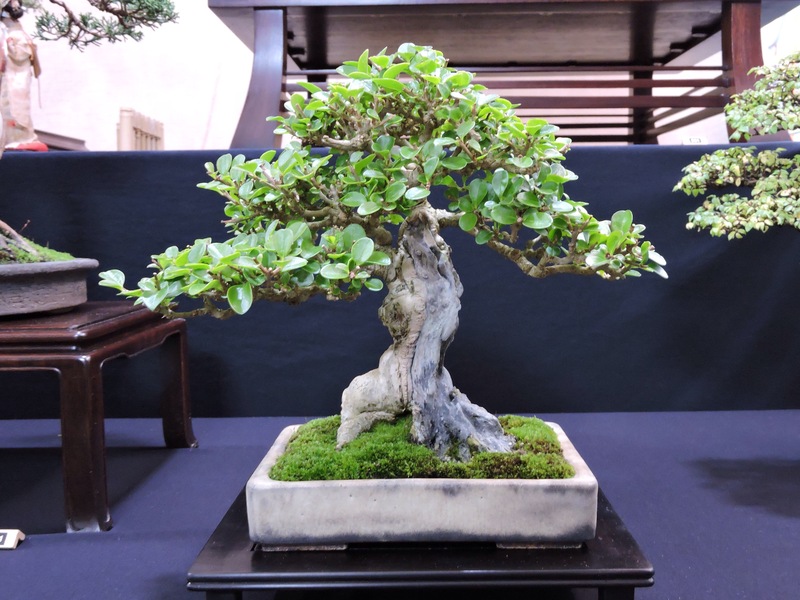 The stand is just the back drop to the main event, the bonsai. 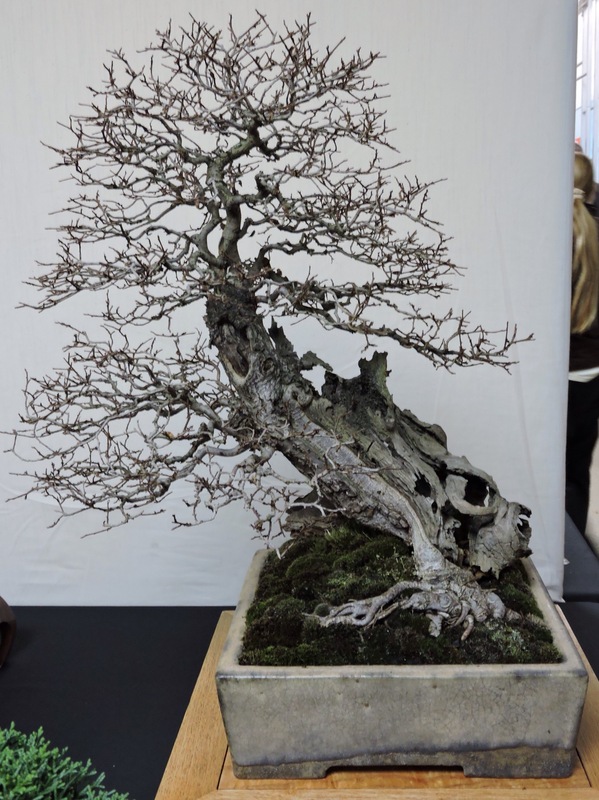 Even great trees on a shoddy stand won’t look as good as is your not really seeing the stand as its pleasing on the eye and not jarring it. 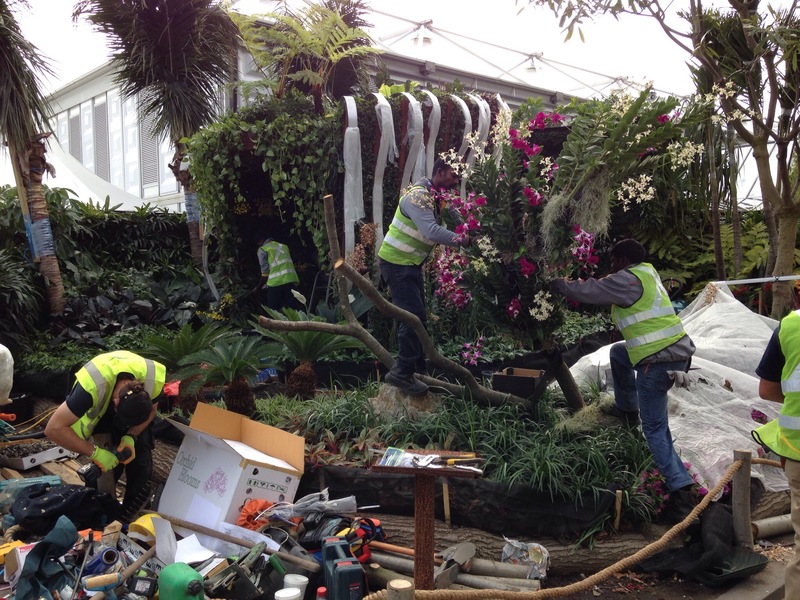 So over the weekend the stars will be added and final touches will hopefully catch the judges eye for a decent medal. 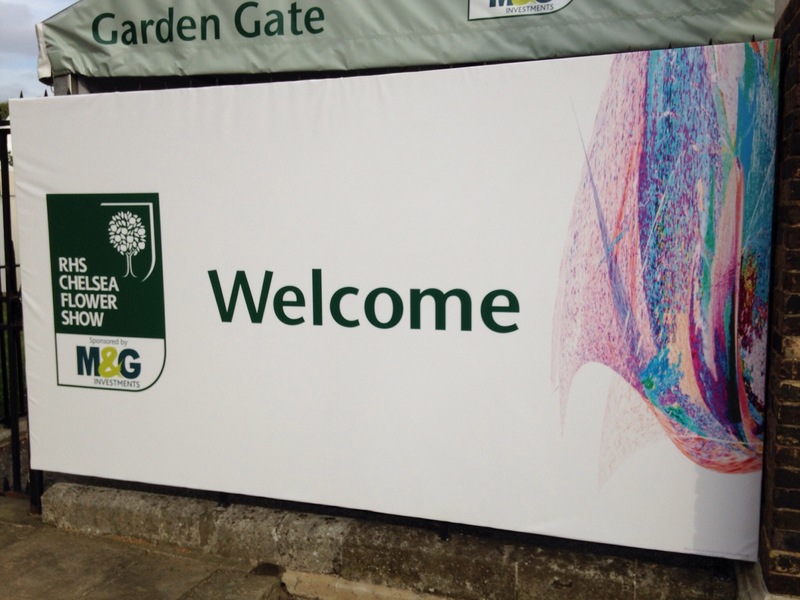 On the way out to catch the train home we got a sneak look at a few of the gardens down the main avenue. 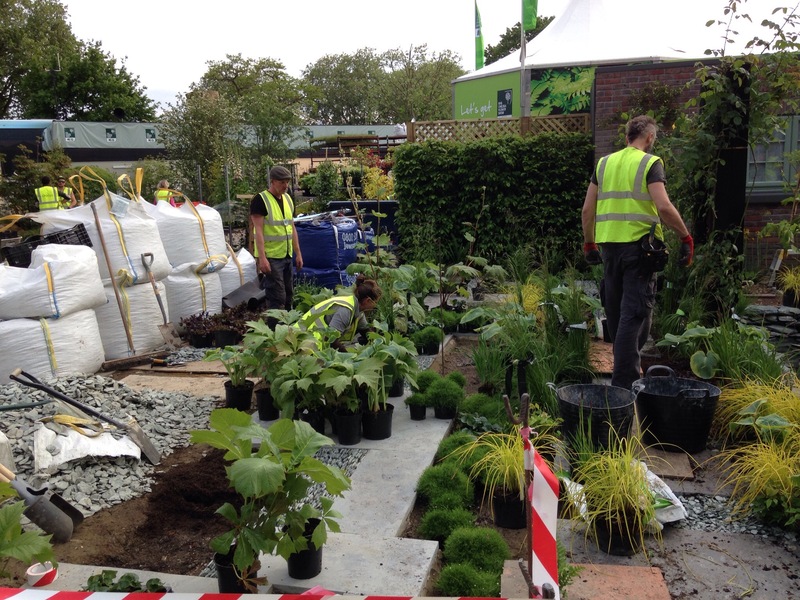 Some of you may recognise the chap in the flat cap from the Great Chelsea garden programme Sean seemed quite relaxed in his garden and it looked good you will have to watch TV to see it as it would not be fair to show it now. 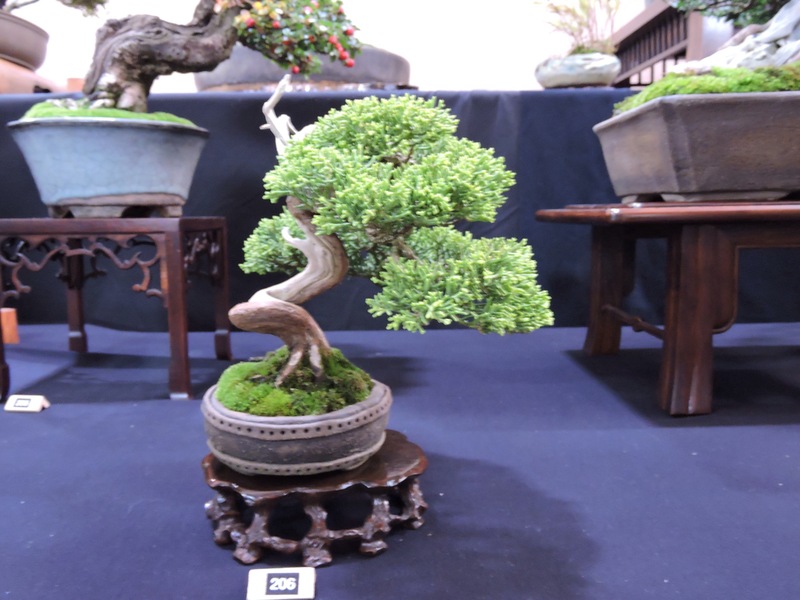 I will update the blog with pictures I hope someone will send me during the week. 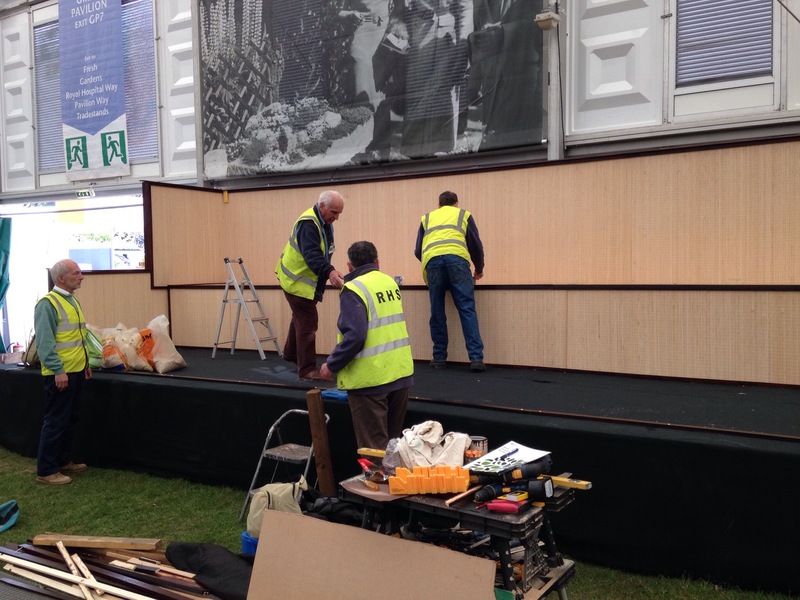 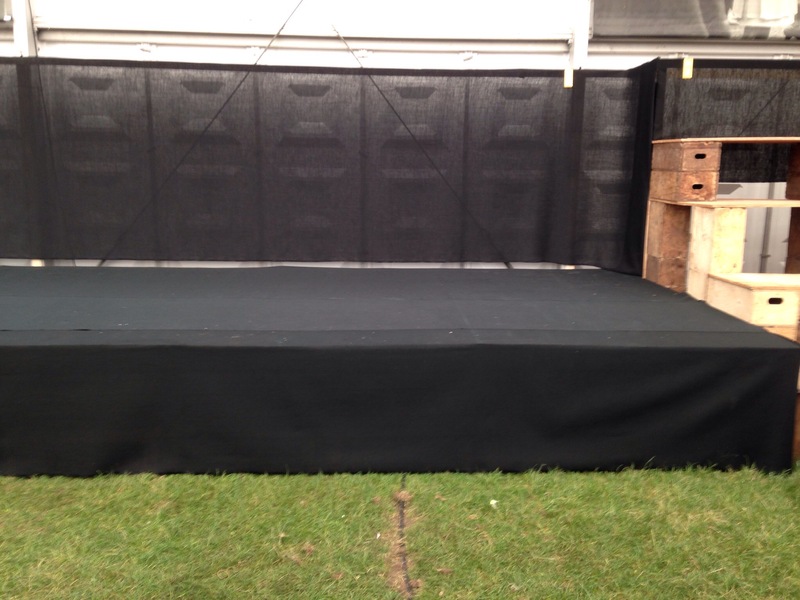 This link on Swindons blog shows some more of the stand.